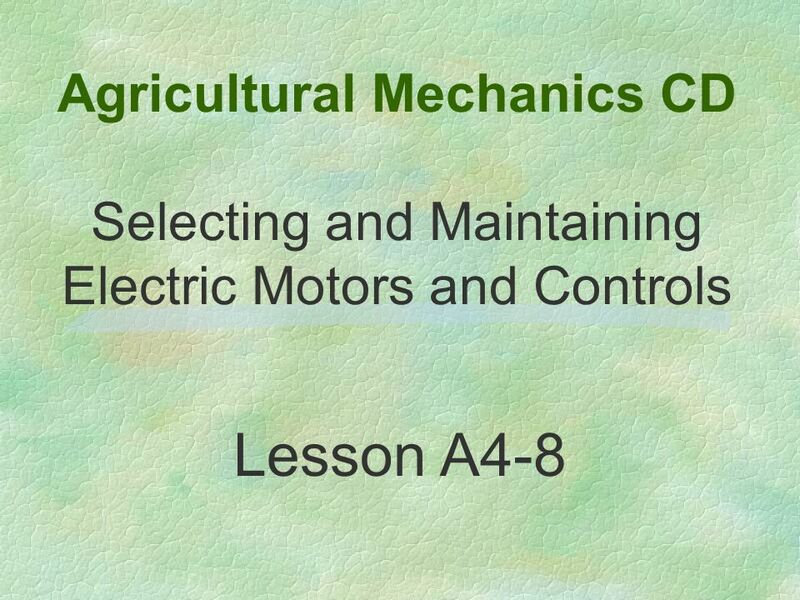 Agricultural Mechanics CD Selecting and Maintaining Electric Motors and Controls Lesson A4-8. 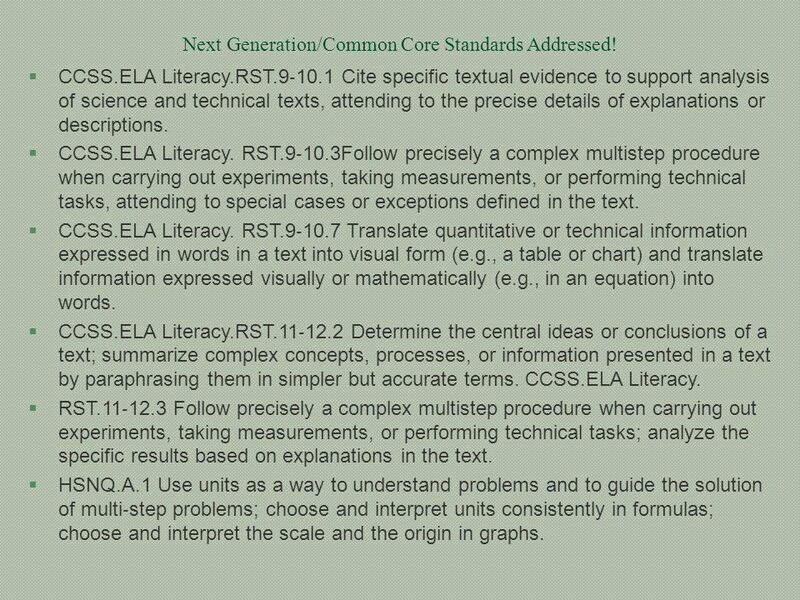 4 Next Generation/Common Core Standards Addressed! CCSS.ELA Literacy.RST.9‐10.1 Cite specific textual evidence to support analysis of science and technical texts, attending to the precise details of explanations or descriptions. CCSS.ELA Literacy. RST.9‐10.3Follow precisely a complex multistep procedure when carrying out experiments, taking measurements, or performing technical tasks, attending to special cases or exceptions defined in the text. CCSS.ELA Literacy. RST.9‐10.7 Translate quantitative or technical information expressed in words in a text into visual form (e.g., a table or chart) and translate information expressed visually or mathematically (e.g., in an equation) into words. CCSS.ELA Literacy.RST.11‐12.2 Determine the central ideas or conclusions of a text; summarize complex concepts, processes, or information presented in a text by paraphrasing them in simpler but accurate terms. CCSS.ELA Literacy. RST.11‐12.3 Follow precisely a complex multistep procedure when carrying out experiments, taking measurements, or performing technical tasks; analyze the specific results based on explanations in the text. HSNQ.A.1 Use units as a way to understand problems and to guide the solution of multi‐step problems; choose and interpret units consistently in formulas; choose and interpret the scale and the origin in graphs. 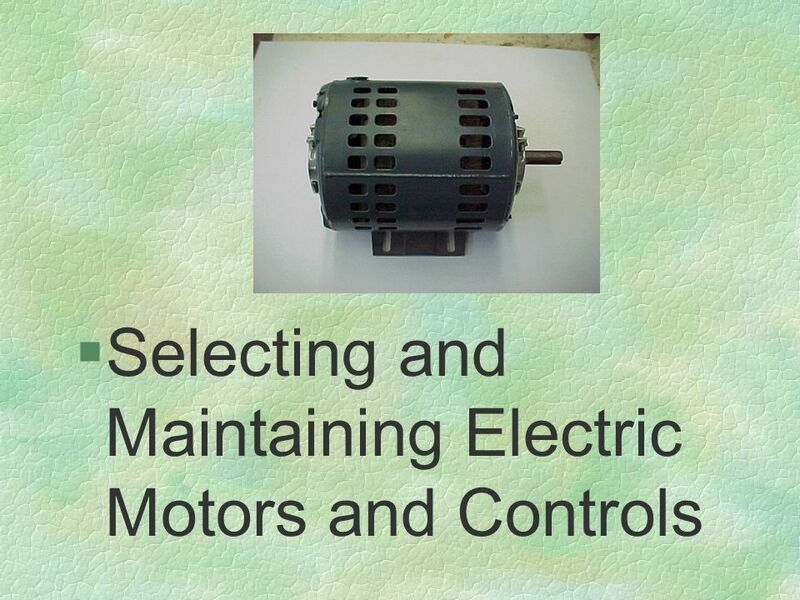 Identify and explain the advantages of electric motors. 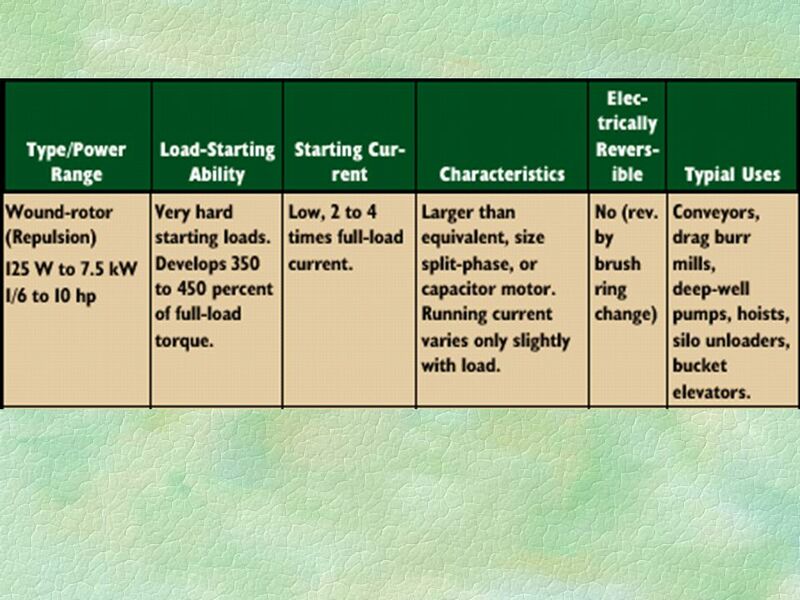 Describe factors to consider in selecting electric motors. 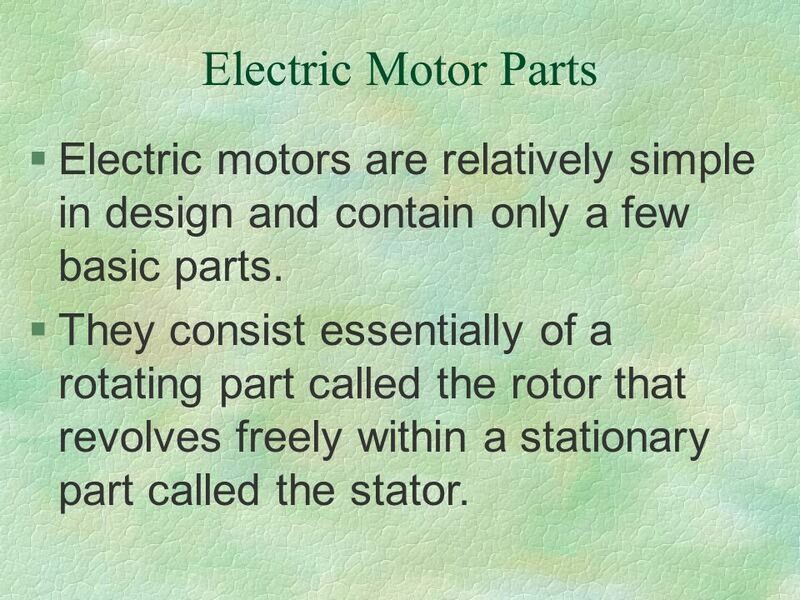 Describe the basic parts of an electric motor. 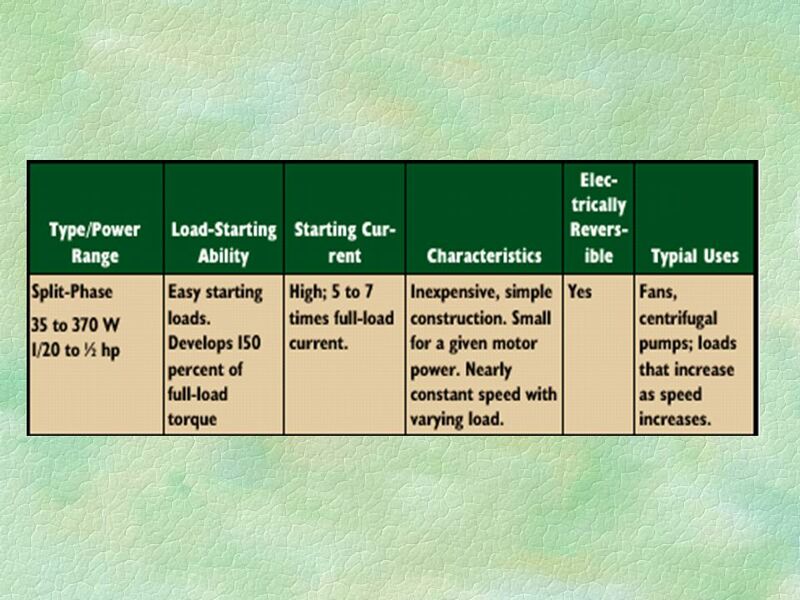 Discuss the basic types of electric motors and their differences. 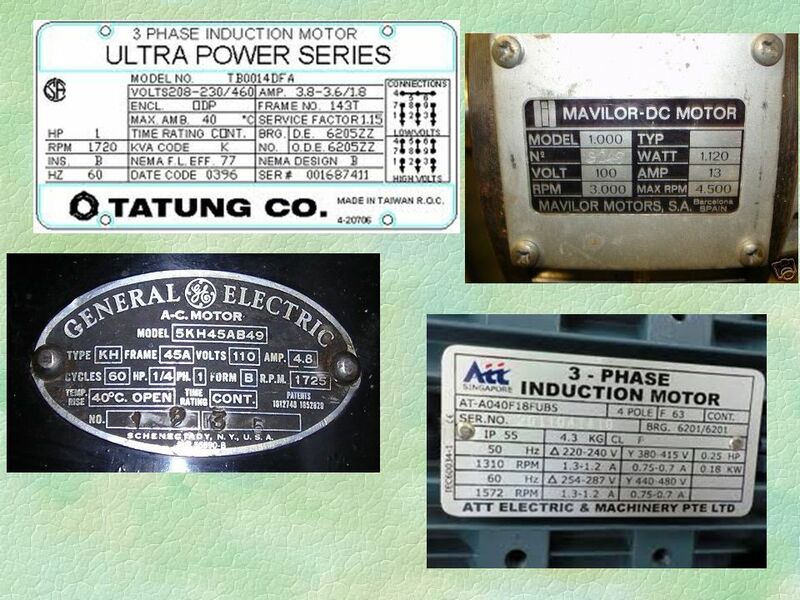 Identify and describe the different types of motor enclosures. 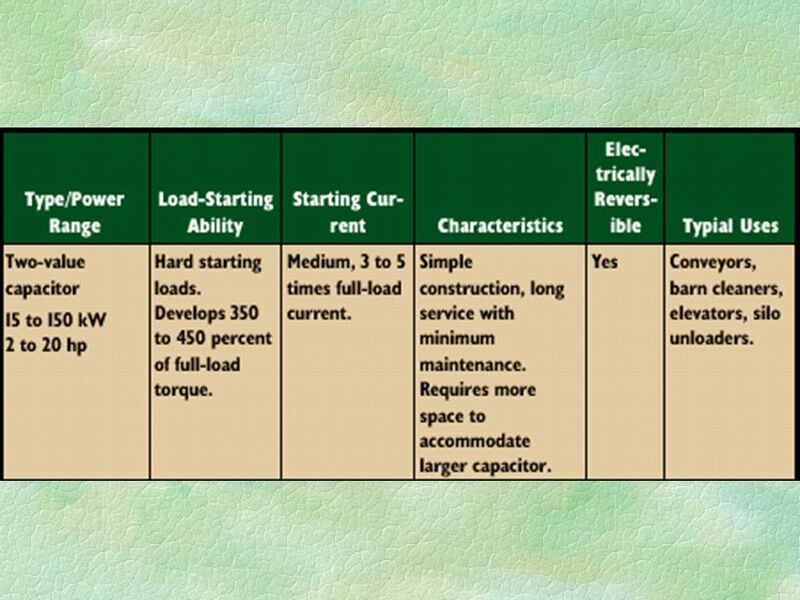 Describe the proper maintenance and care principles for electric motors. 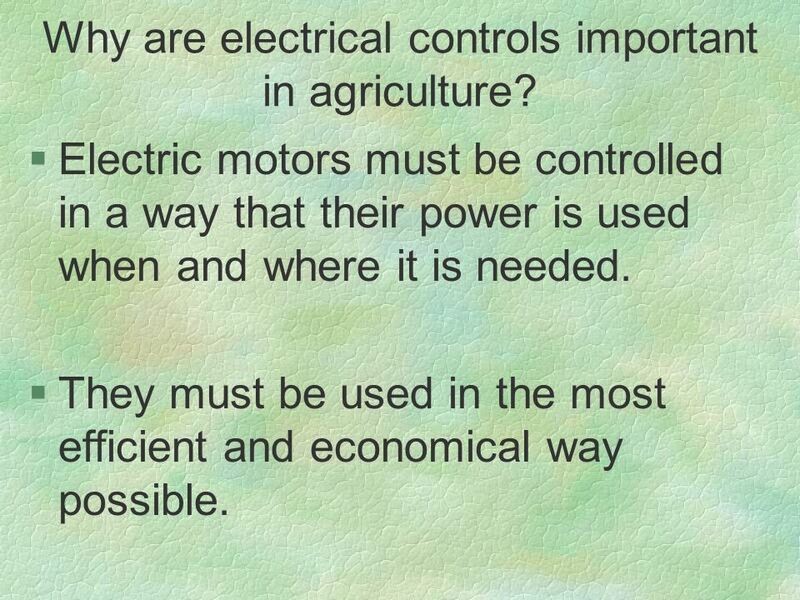 Describe the importance of electrical controls in agriculture. 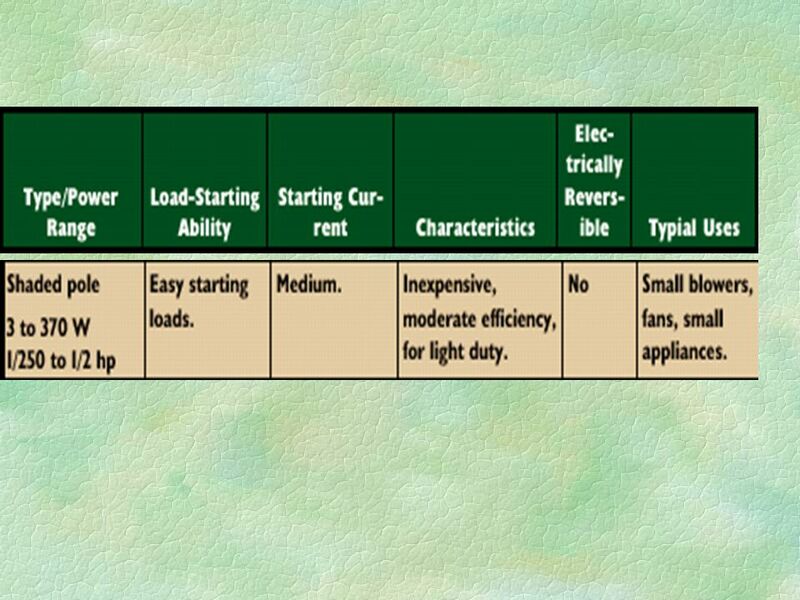 Describe the proper maintenance principles for electrical controls. 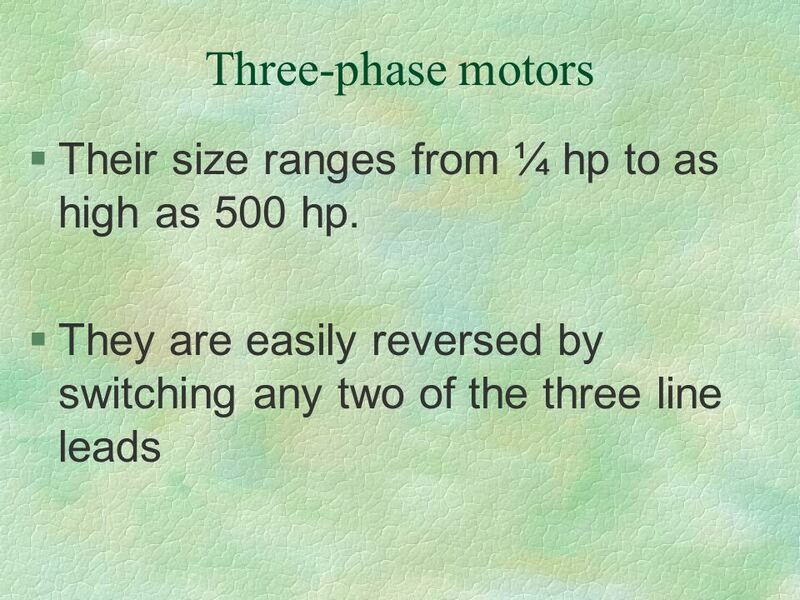 9 Interest Approach Here are 3 different examples of electric motors. How are these motors different? 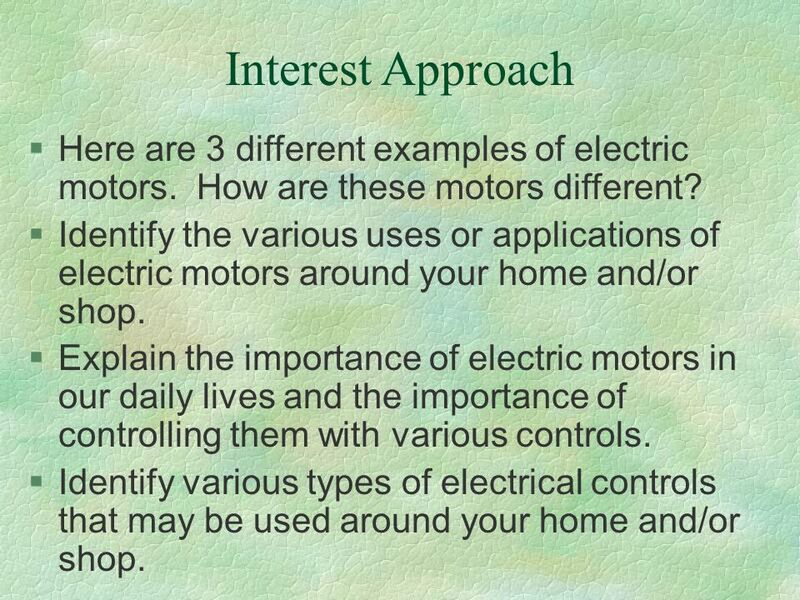 Identify the various uses or applications of electric motors around your home and/or shop. Explain the importance of electric motors in our daily lives and the importance of controlling them with various controls. Identify various types of electrical controls that may be used around your home and/or shop. 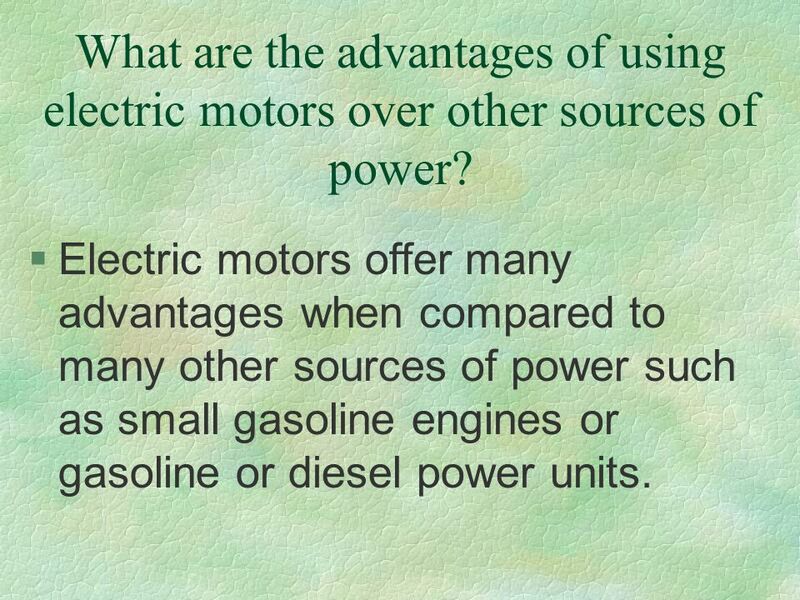 10 What are the advantages of using electric motors over other sources of power? 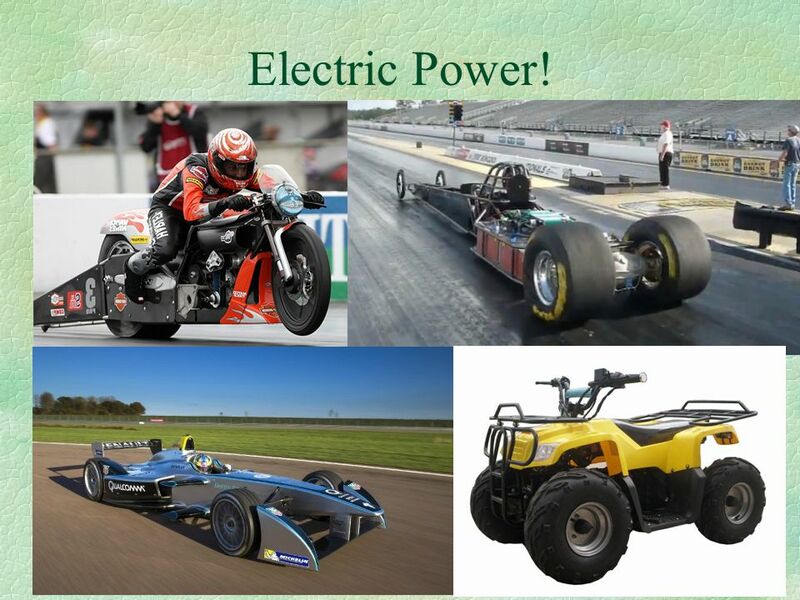 Electric motors offer many advantages when compared to many other sources of power such as small gasoline engines or gasoline or diesel power units. 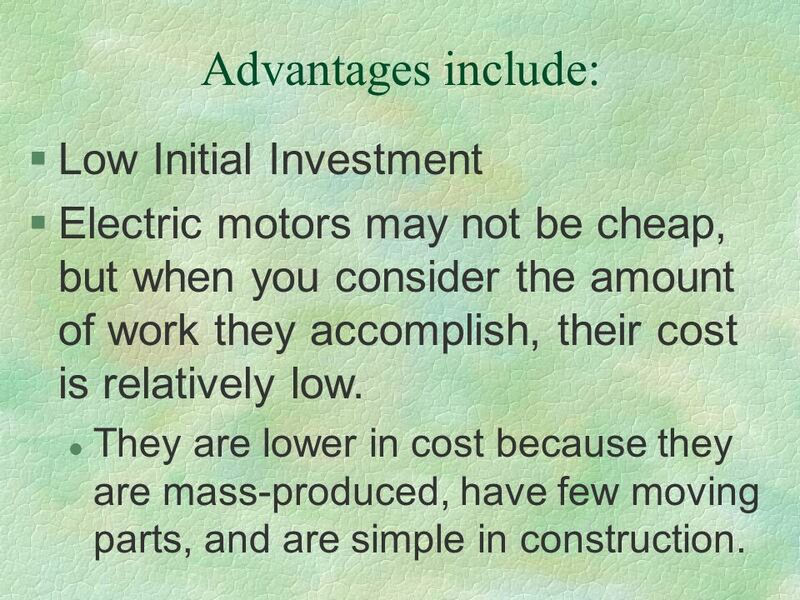 Electric motors may not be cheap, but when you consider the amount of work they accomplish, their cost is relatively low. They are lower in cost because they are mass-produced, have few moving parts, and are simple in construction. 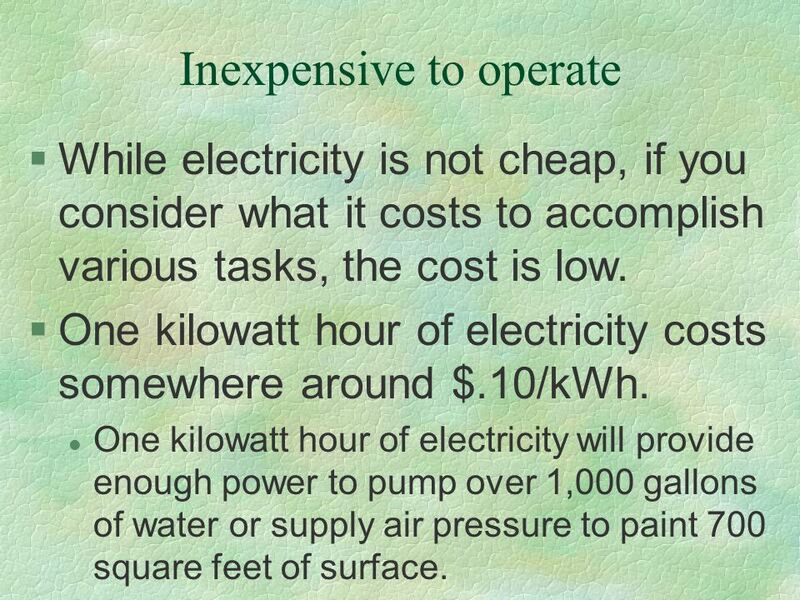 While electricity is not cheap, if you consider what it costs to accomplish various tasks, the cost is low. One kilowatt hour of electricity costs somewhere around $.10/kWh. One kilowatt hour of electricity will provide enough power to pump over 1,000 gallons of water or supply air pressure to paint 700 square feet of surface. 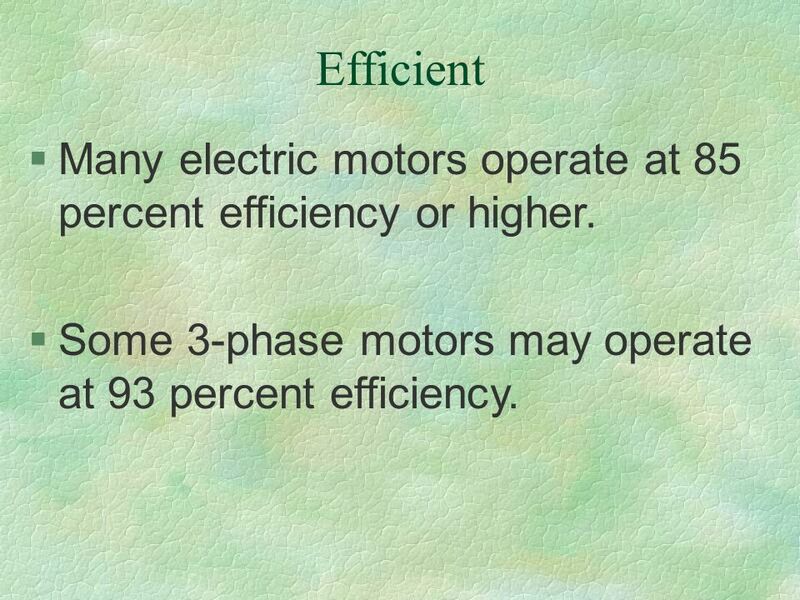 13 Efficient Many electric motors operate at 85 percent efficiency or higher. Some 3-phase motors may operate at 93 percent efficiency. 15 Simple to operate May be started or stopped by flicking a switch, pushing a button, moving a lever, or automatically by an electrical control. 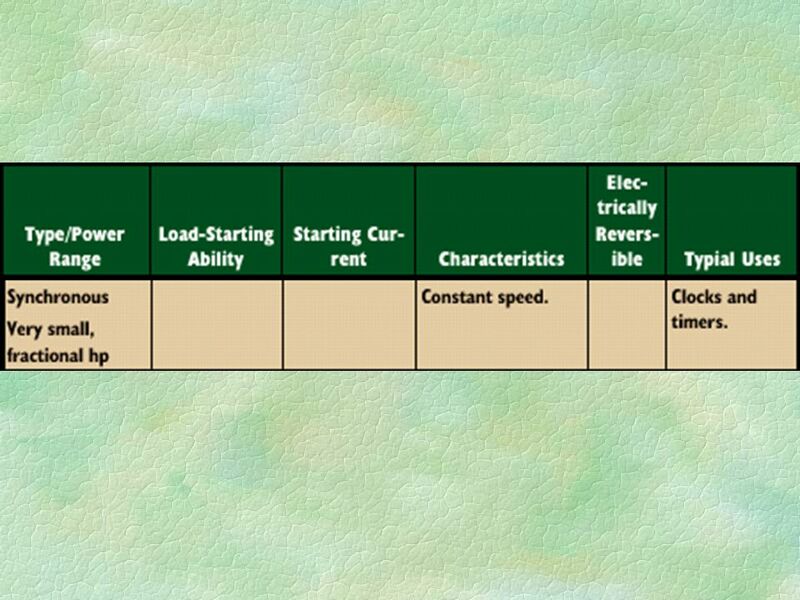 Almost immediate full power, no gradual acceleration. 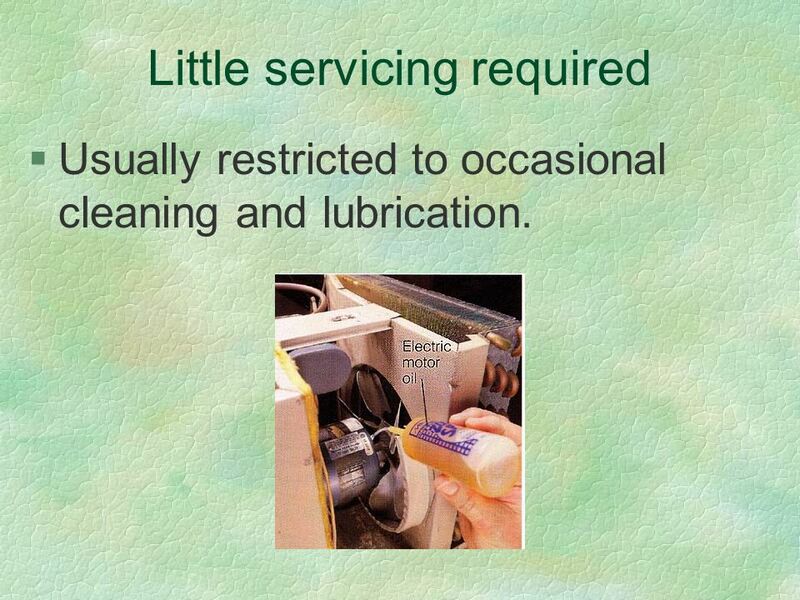 Usually restricted to occasional cleaning and lubrication. 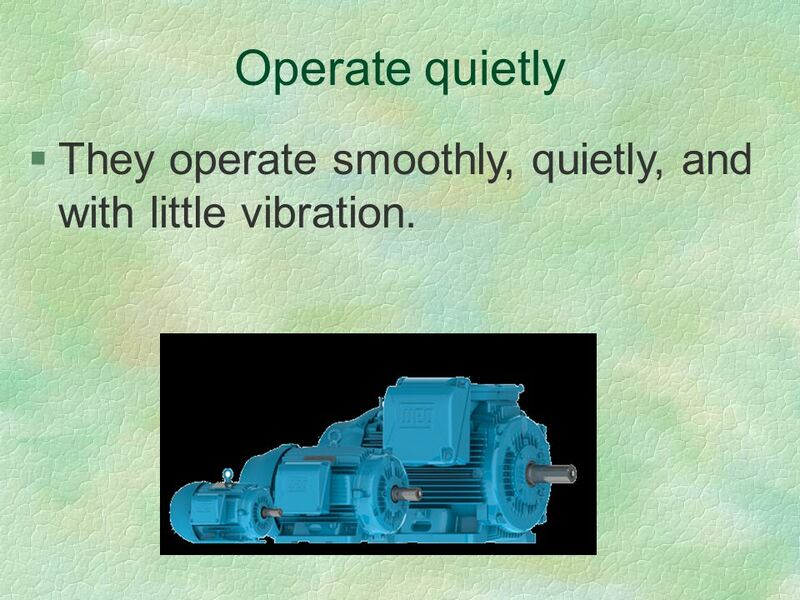 17 Operate quietly They operate smoothly, quietly, and with little vibration. 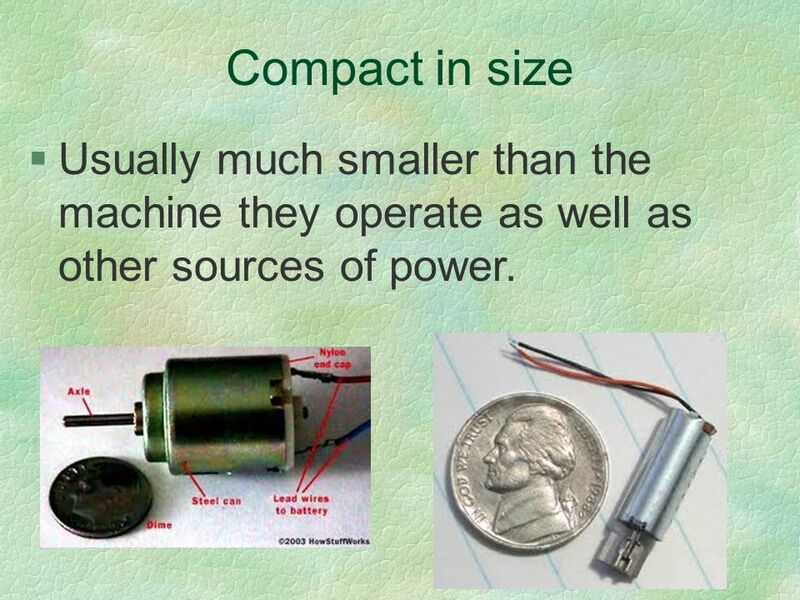 18 Compact in size Usually much smaller than the machine they operate as well as other sources of power. 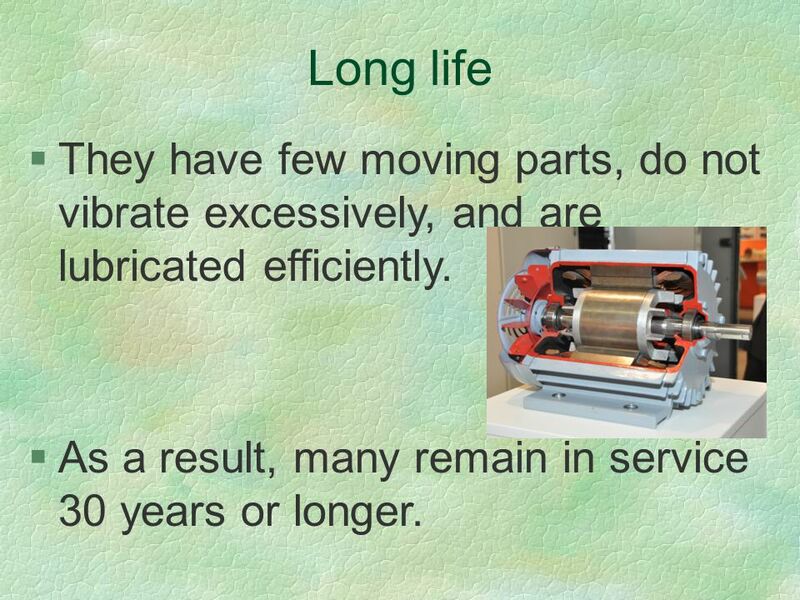 19 Long life They have few moving parts, do not vibrate excessively, and are lubricated efficiently. As a result, many remain in service 30 years or longer. 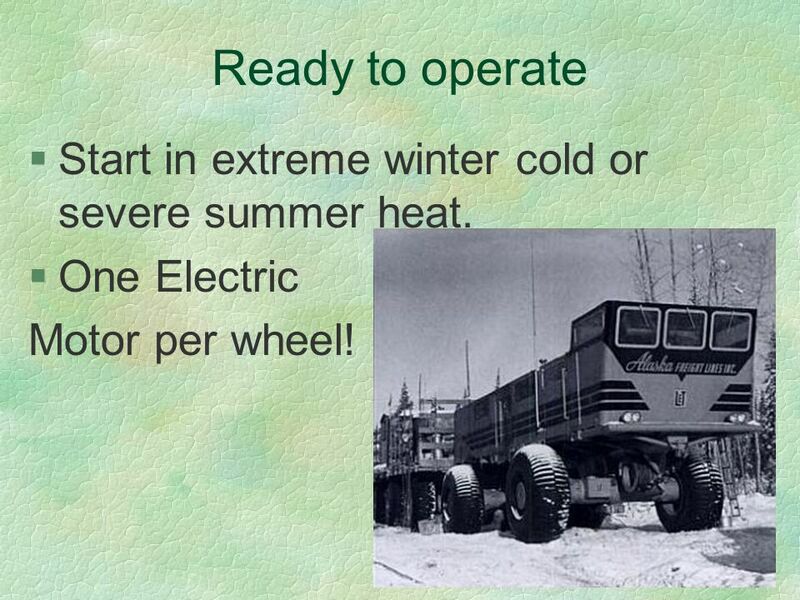 20 Ready to operate Start in extreme winter cold or severe summer heat. One Electric Motor per wheel! 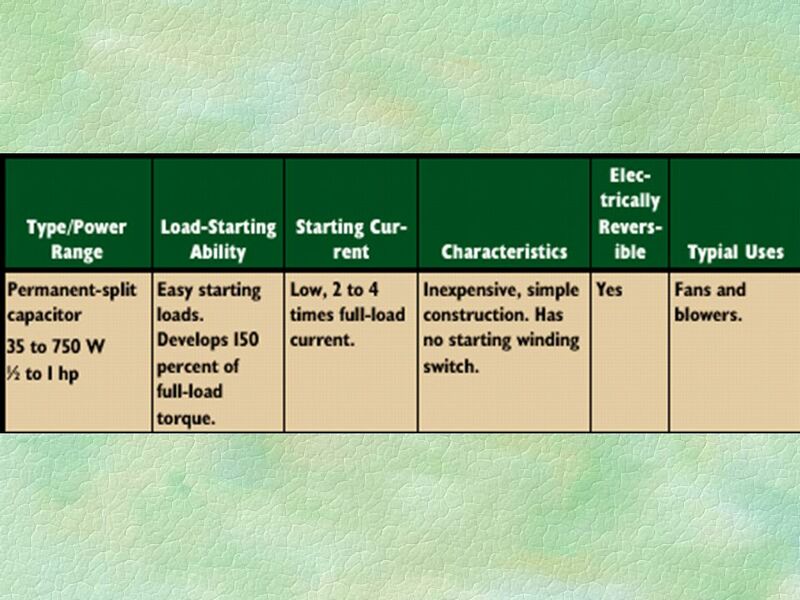 Many electric motors are designed to start under load, which eliminates the need for a clutch or transmission. They are designed to carry up to one and a half times their rated capacity for short periods. 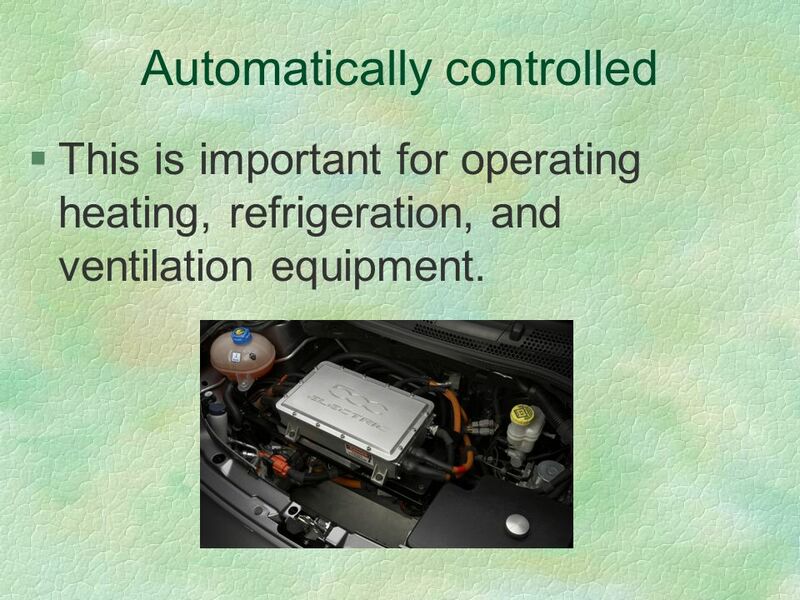 This is important for operating heating, refrigeration, and ventilation equipment. 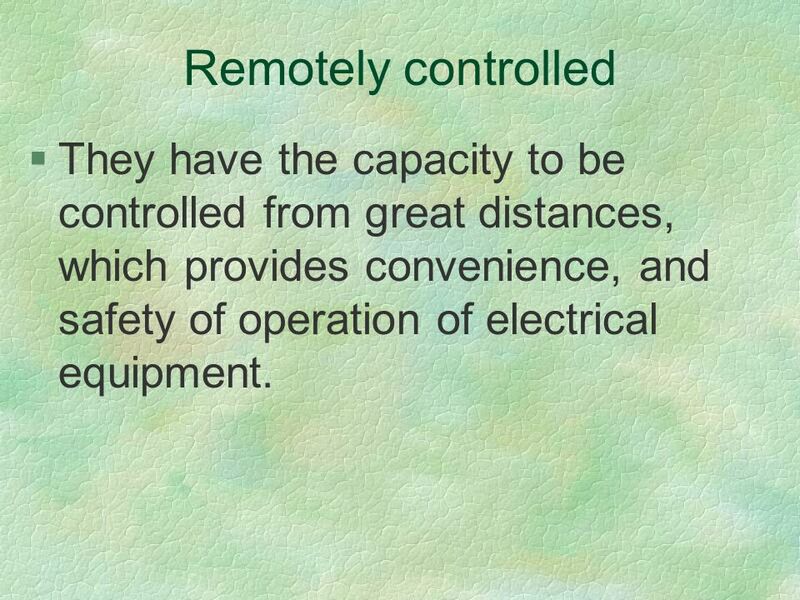 24 Remotely controlled They have the capacity to be controlled from great distances, which provides convenience, and safety of operation of electrical equipment. 25 Adaptable They may be moved from one operation to another by remounting the motor and changing the pulley and the belt. 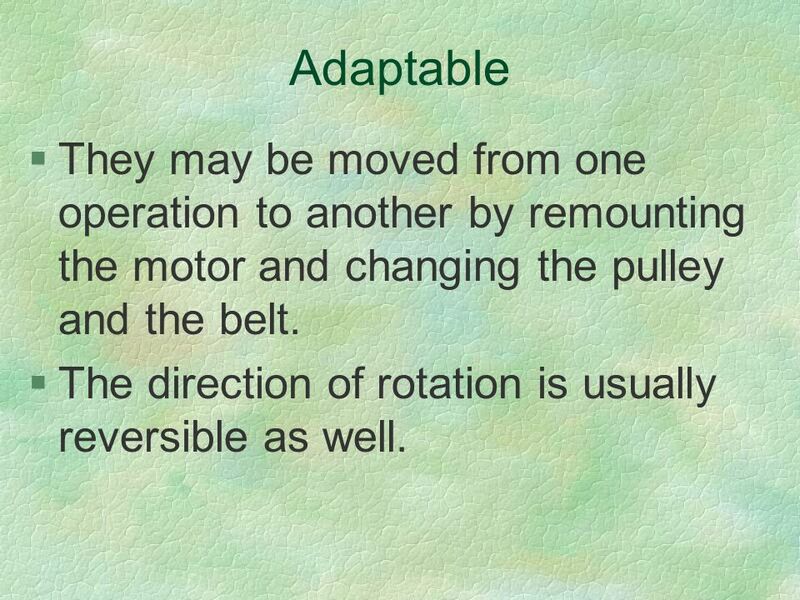 The direction of rotation is usually reversible as well. 26 Portable They are light, easily moved, and readily mounted so they may be taken to the job. 27 Safe to operate They are designed to prevent the operator from coming into contact with live wires or other electrical parts. They use no volatile fuel, give off no dangerous exhaust gases or fumes, have no hot exhaust manifold, and have no open gears to provide a safety hazard to operator or others. 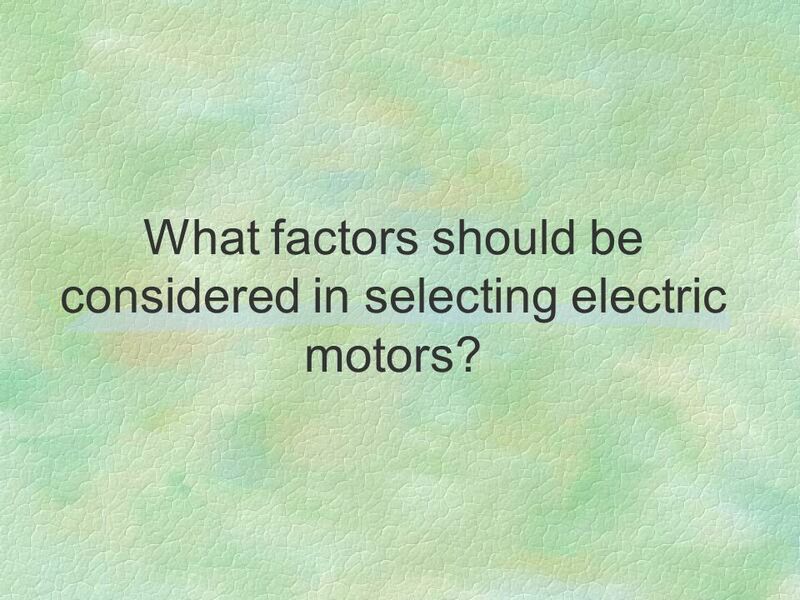 28 What factors should be considered in selecting electric motors? AC (alternating current) may be 120, 240, or 208 voltage. 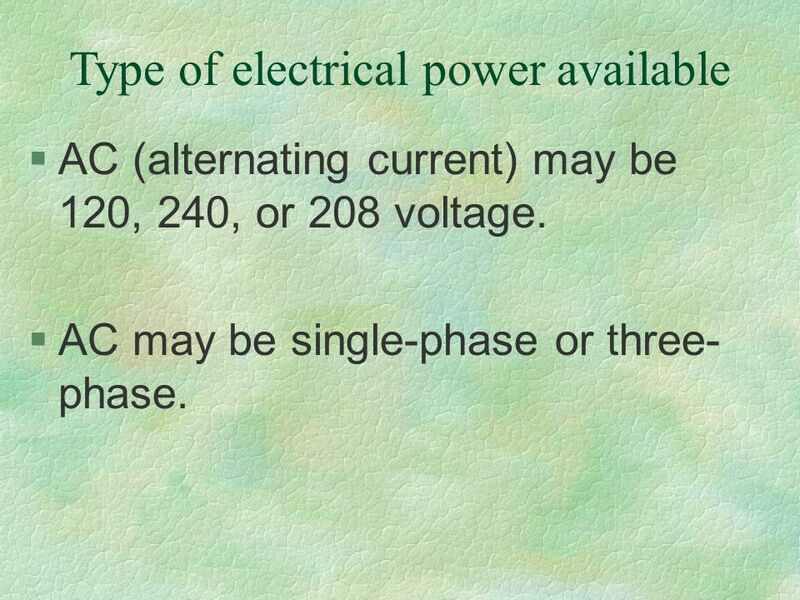 AC may be single-phase or three-phase. 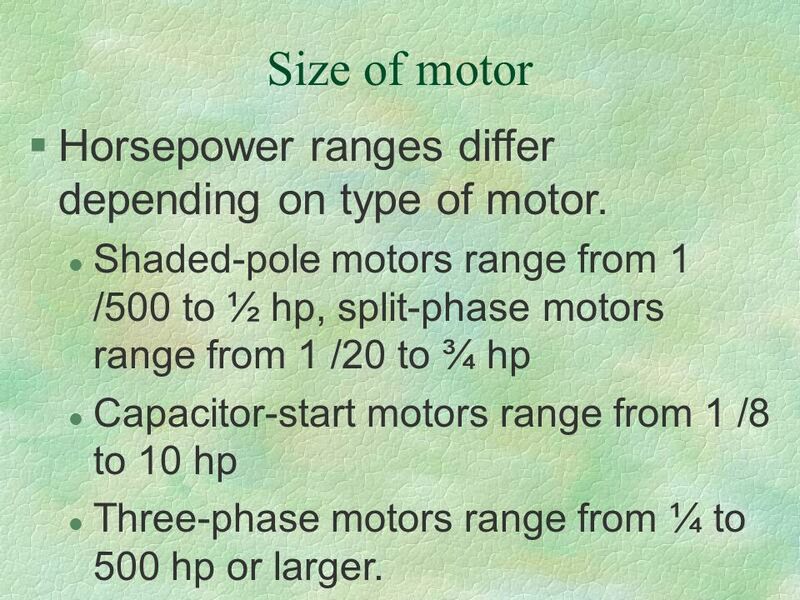 30 Size of motor Horsepower ranges differ depending on type of motor. Shaded-pole motors range from 1 /500 to ½ hp, split-phase motors range from 1 /20 to ¾ hp Capacitor-start motors range from 1 /8 to 10 hp Three-phase motors range from ¼ to 500 hp or larger. 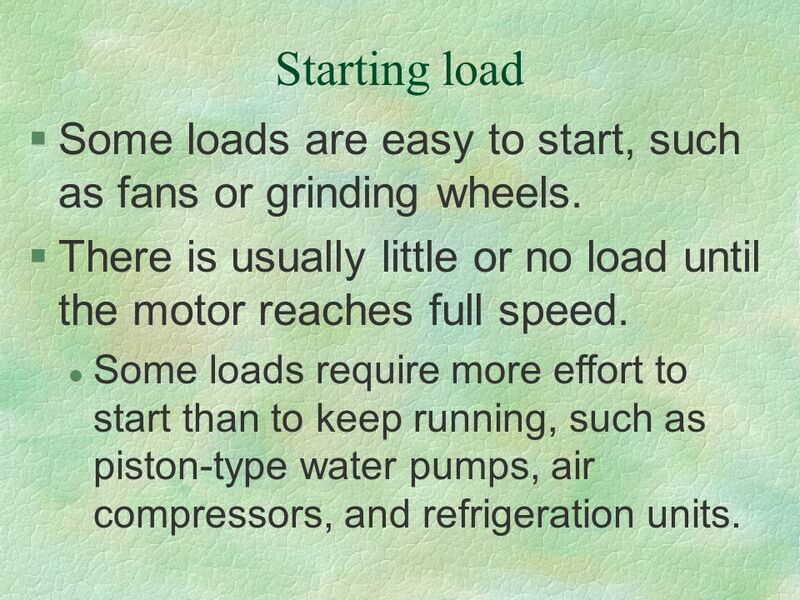 31 Starting load Some loads are easy to start, such as fans or grinding wheels. 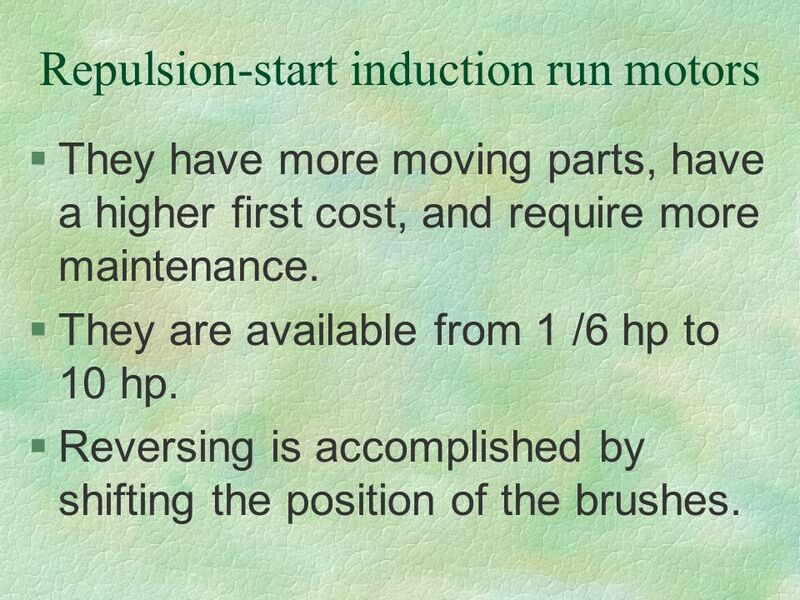 There is usually little or no load until the motor reaches full speed. Some loads require more effort to start than to keep running, such as piston-type water pumps, air compressors, and refrigeration units. 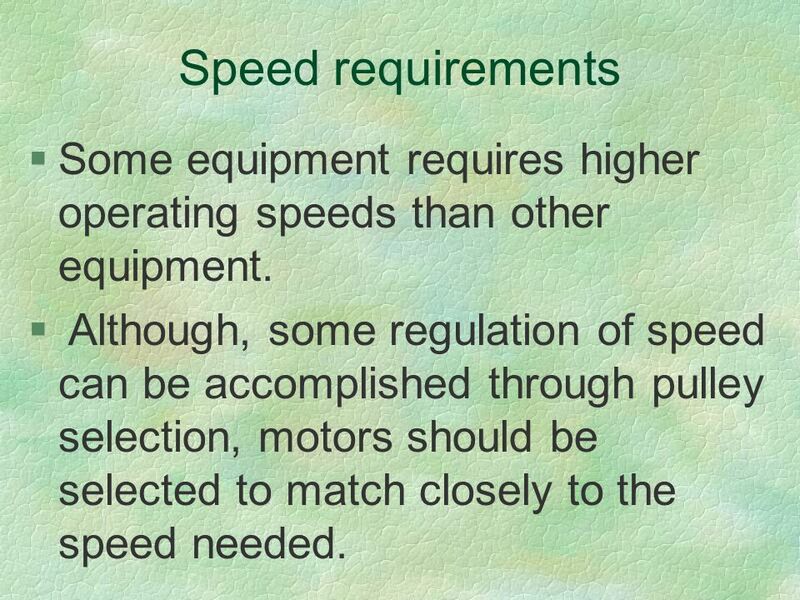 32 Speed requirements Some equipment requires higher operating speeds than other equipment. 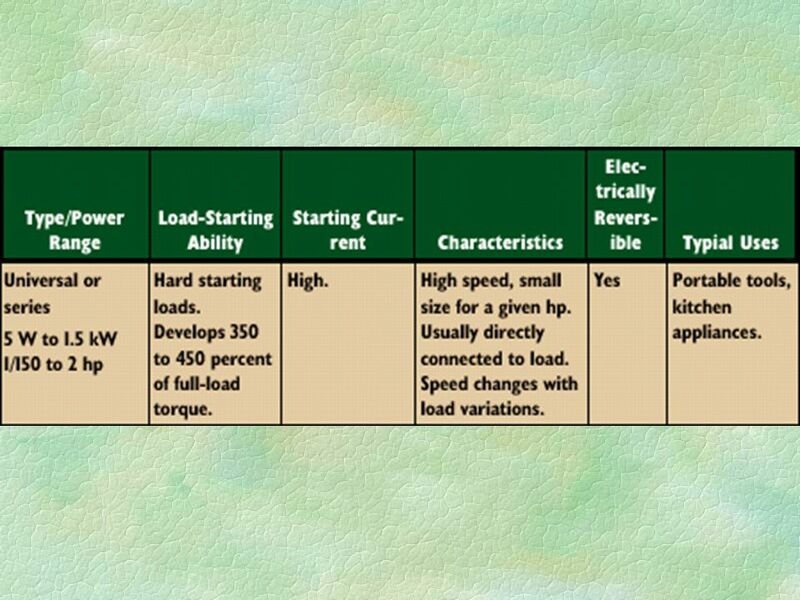 Although, some regulation of speed can be accomplished through pulley selection, motors should be selected to match closely to the speed needed. 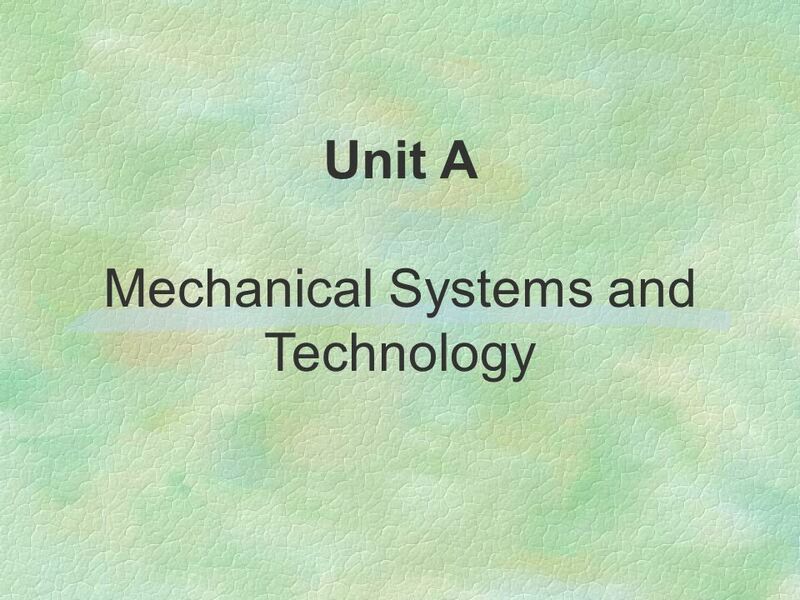 33 Type of bearings Depending on size and type, motors may provide a choice between sleeve bearings or ball bearings. 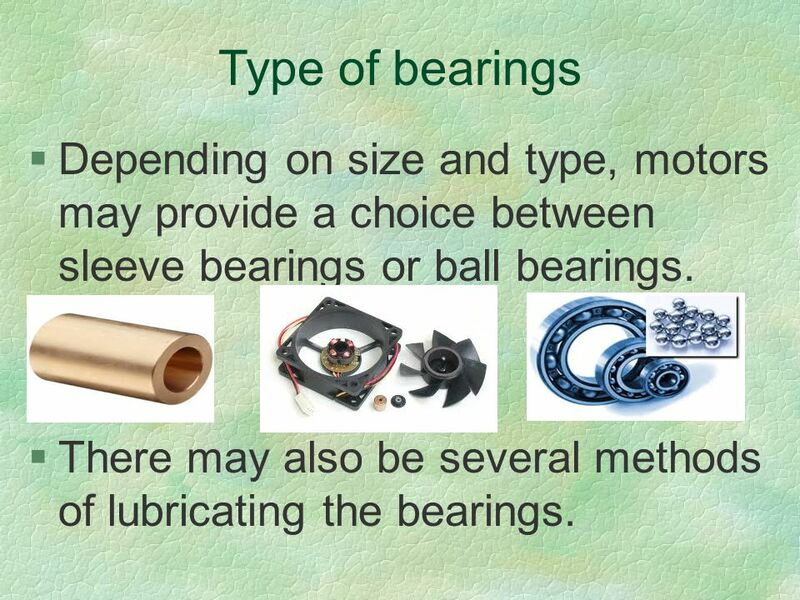 There may also be several methods of lubricating the bearings. 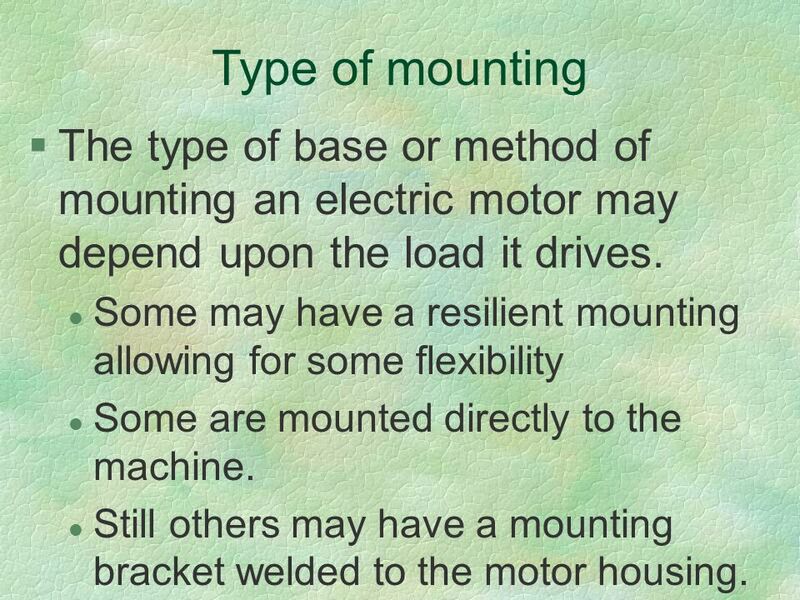 34 Type of mounting The type of base or method of mounting an electric motor may depend upon the load it drives. Some may have a resilient mounting allowing for some flexibility Some are mounted directly to the machine. Still others may have a mounting bracket welded to the motor housing. 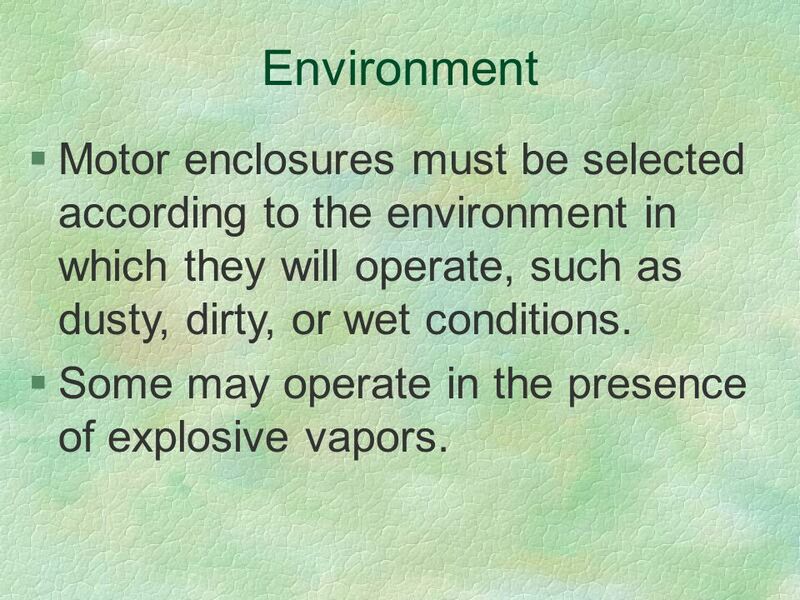 36 Environment Motor enclosures must be selected according to the environment in which they will operate, such as dusty, dirty, or wet conditions. Some may operate in the presence of explosive vapors. 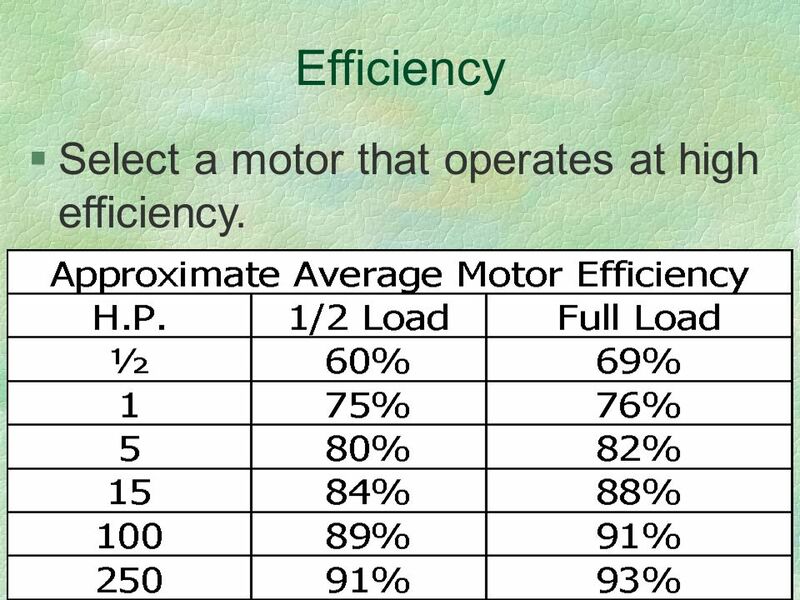 37 Efficiency Select a motor that operates at high efficiency. 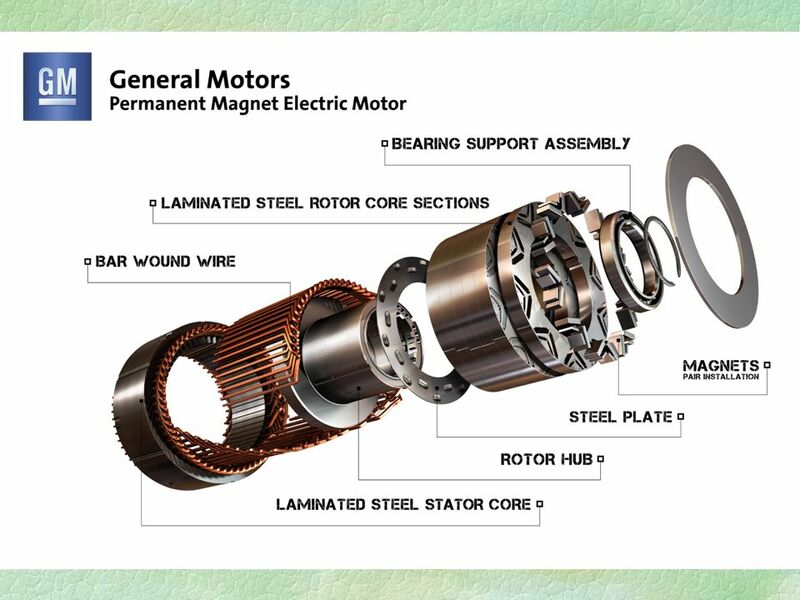 40 What are the basic parts of an electric motor? 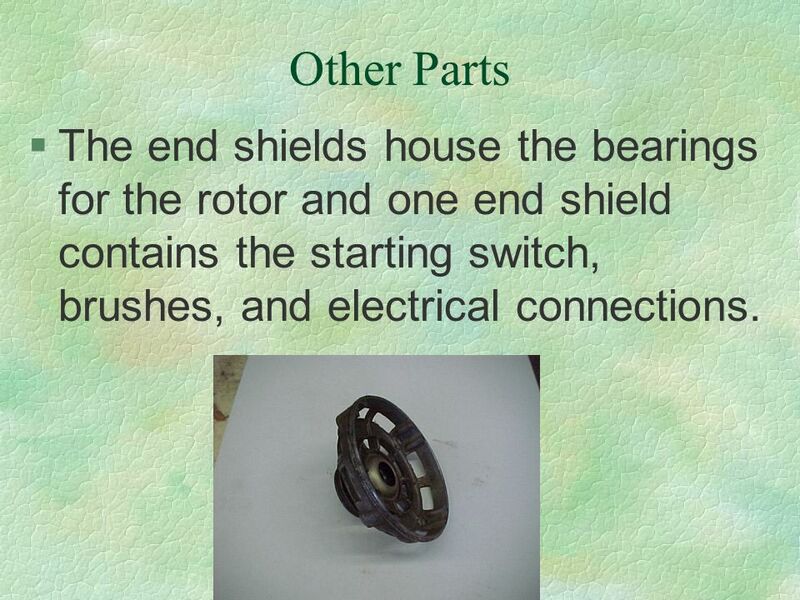 41 Electric Motor Parts Electric motors are relatively simple in design and contain only a few basic parts. 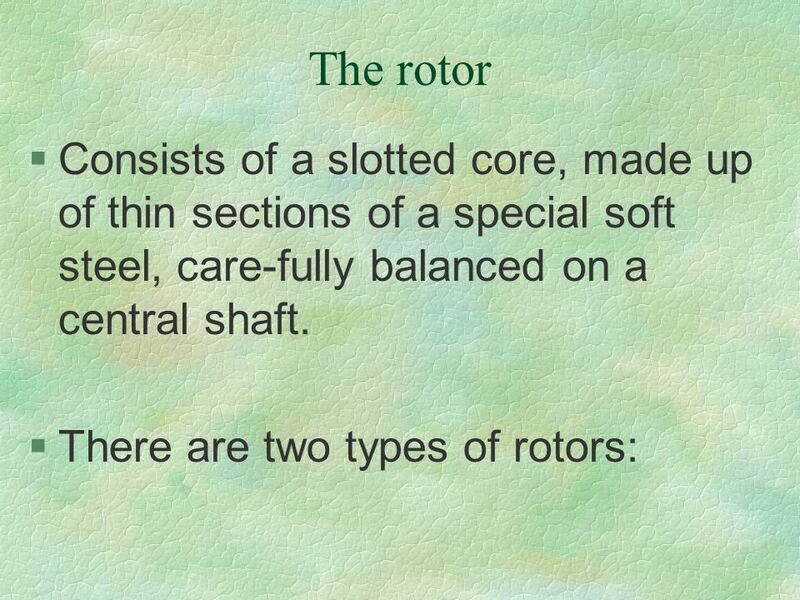 They consist essentially of a rotating part called the rotor that revolves freely within a stationary part called the stator. 45 1. 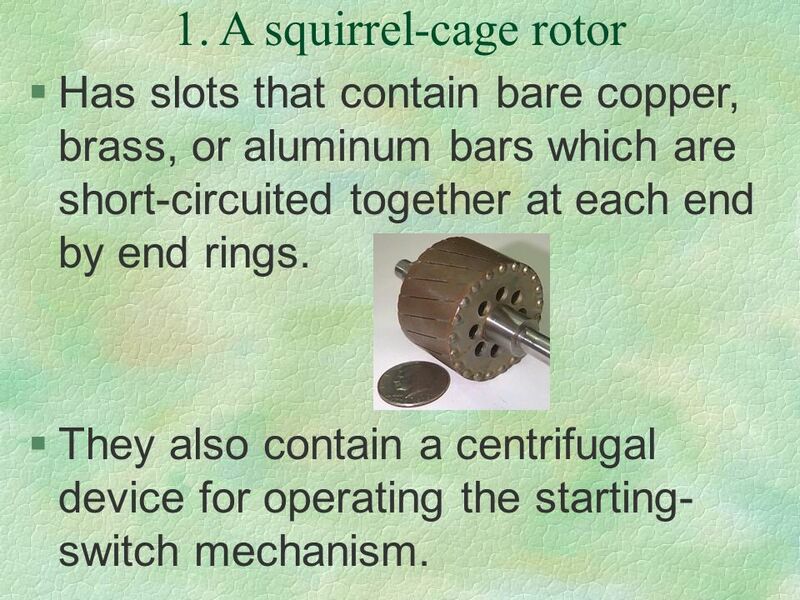 A squirrel-cage rotor Has slots that contain bare copper, brass, or aluminum bars which are short-circuited together at each end by end rings. They also contain a centrifugal device for operating the starting-switch mechanism. 46 2. 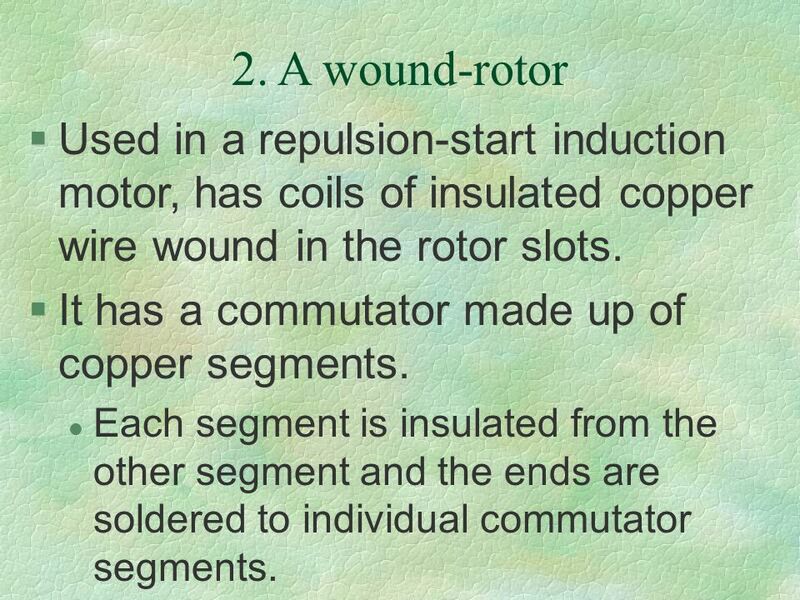 A wound-rotor Used in a repulsion-start induction motor, has coils of insulated copper wire wound in the rotor slots. It has a commutator made up of copper segments. Each segment is insulated from the other segment and the ends are soldered to individual commutator segments. 47 2. 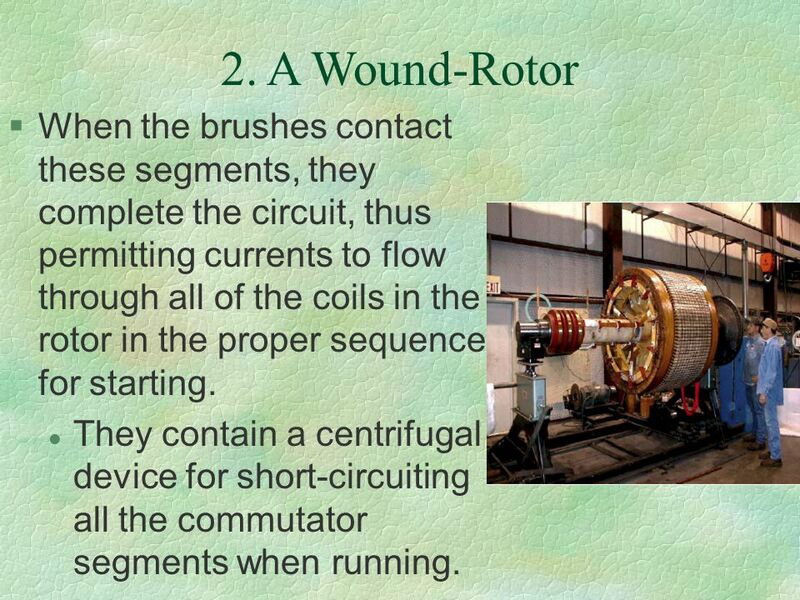 A Wound-Rotor When the brushes contact these segments, they complete the circuit, thus permitting currents to flow through all of the coils in the rotor in the proper sequence for starting. 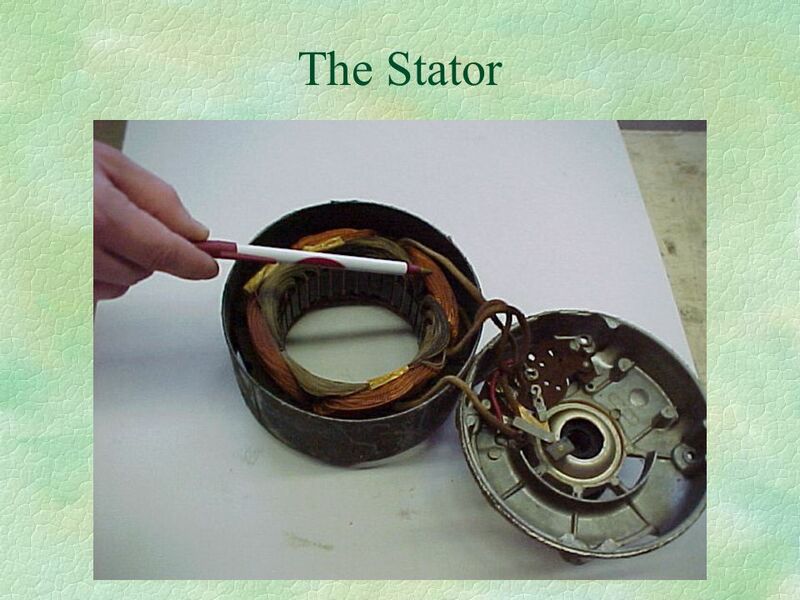 They contain a centrifugal device for short-circuiting all the commutator segments when running. 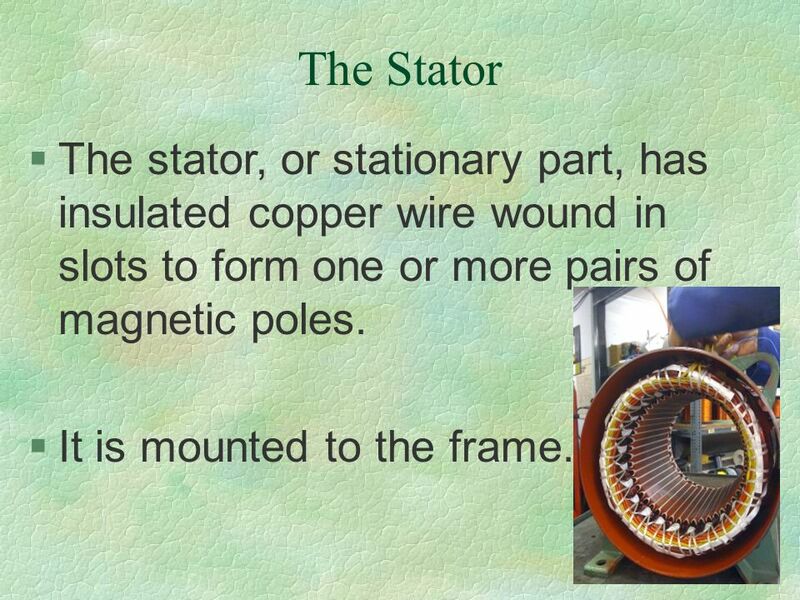 48 The Stator The stator, or stationary part, has insulated copper wire wound in slots to form one or more pairs of magnetic poles. It is mounted to the frame. 50 Other Parts The frame provides for mounting the motor when it is in use. 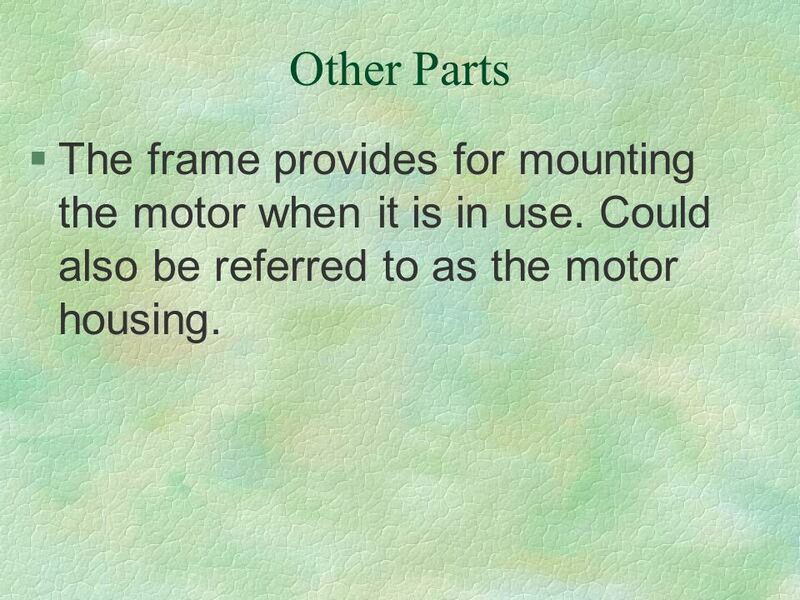 Could also be referred to as the motor housing. 51 Other Parts The end shields house the bearings for the rotor and one end shield contains the starting switch, brushes, and electrical connections. 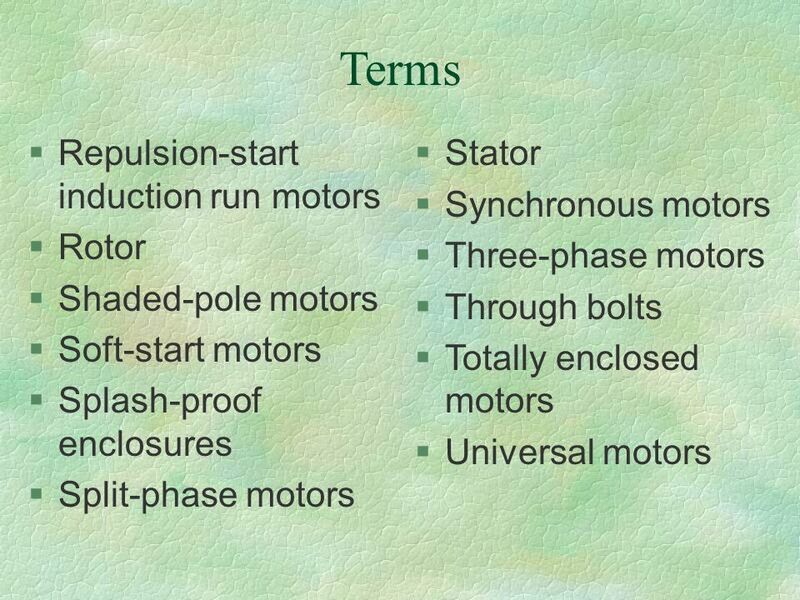 52 What are the basic types of electric motors and how are they different? 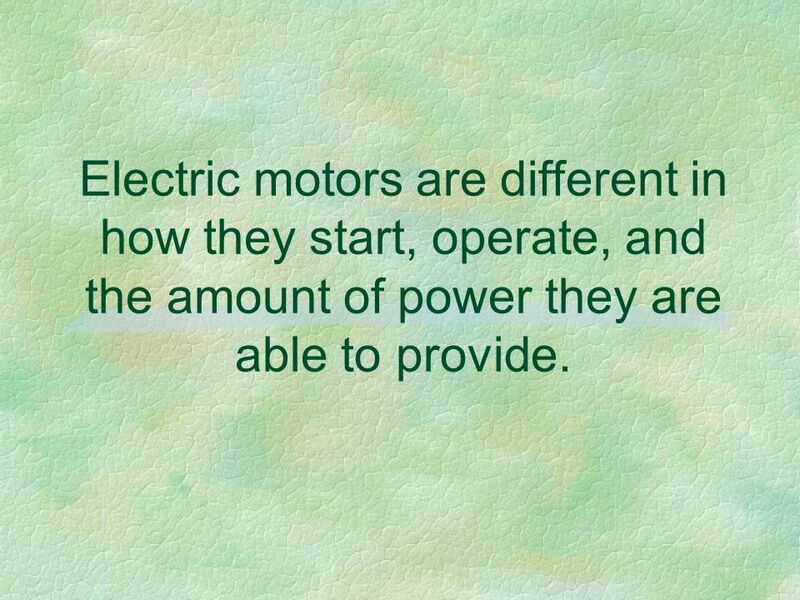 53 Electric motors are different in how they start, operate, and the amount of power they are able to provide. 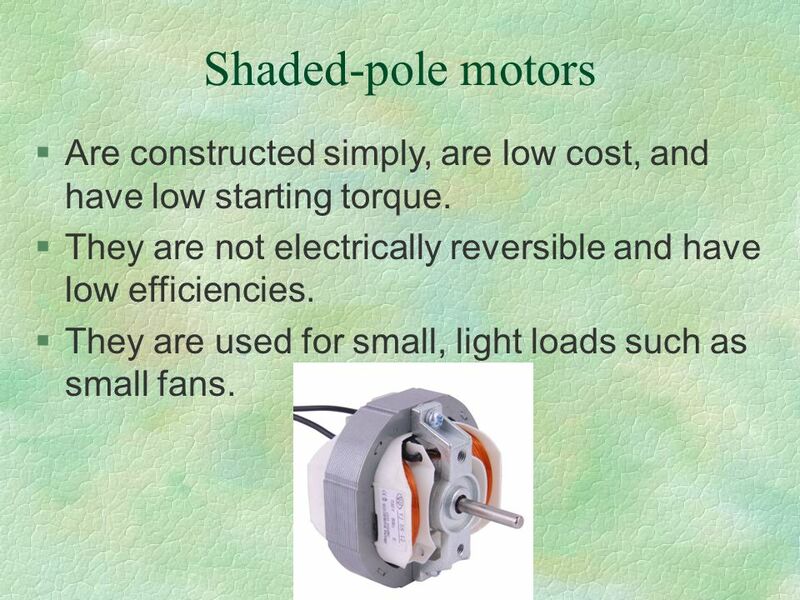 54 Shaded-pole motors Are constructed simply, are low cost, and have low starting torque. They are not electrically reversible and have low efficiencies. They are used for small, light loads such as small fans. 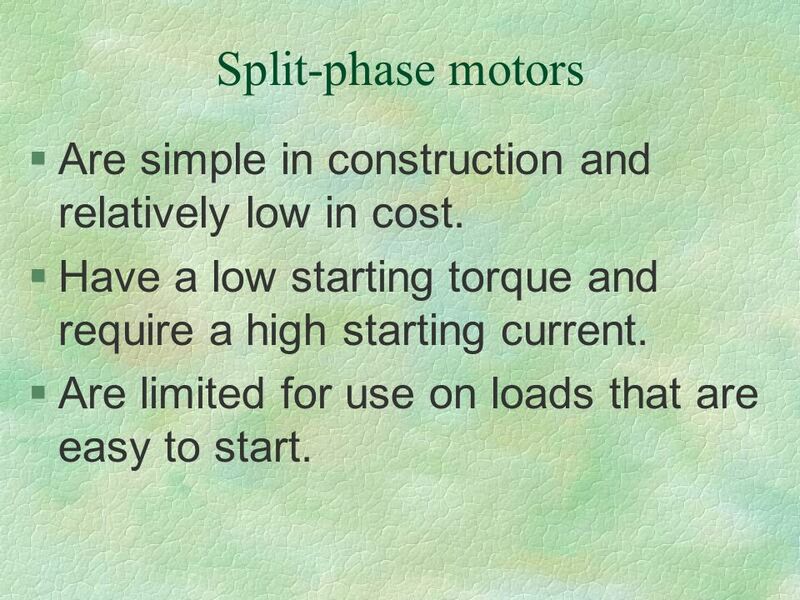 57 Split-phase motors Are simple in construction and relatively low in cost. 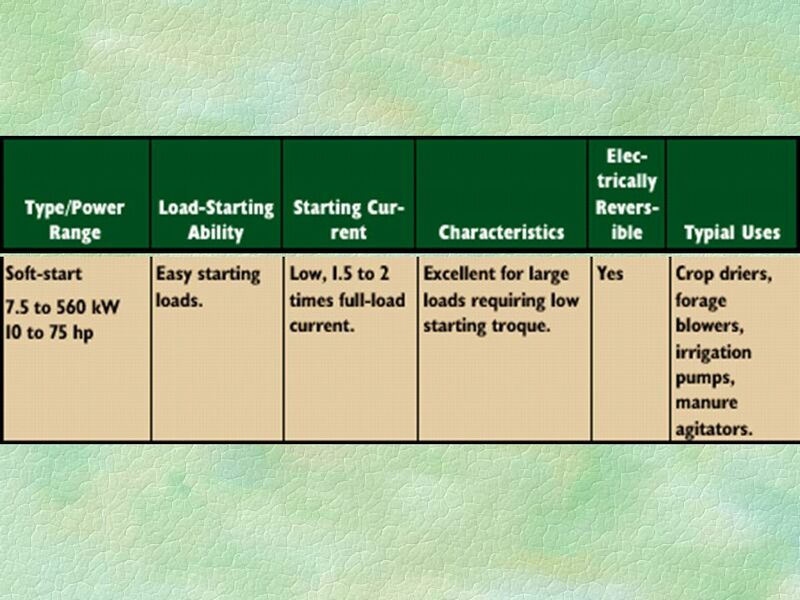 Have a low starting torque and require a high starting current. 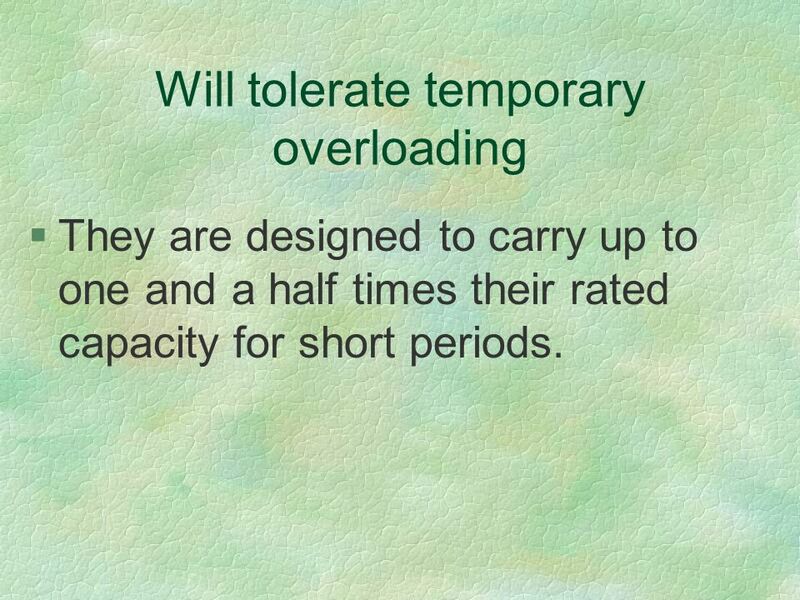 Are limited for use on loads that are easy to start. 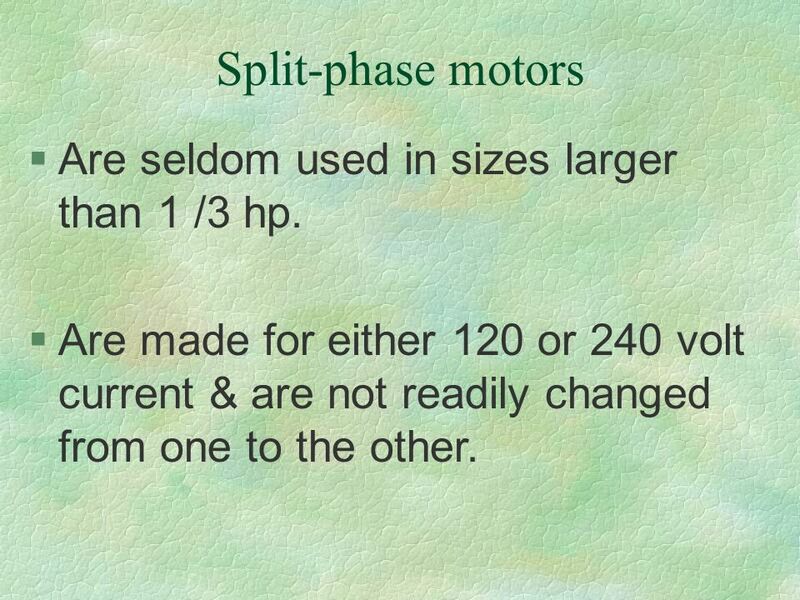 58 Split-phase motors Are seldom used in sizes larger than 1 /3 hp. Are made for either 120 or 240 volt current & are not readily changed from one to the other. 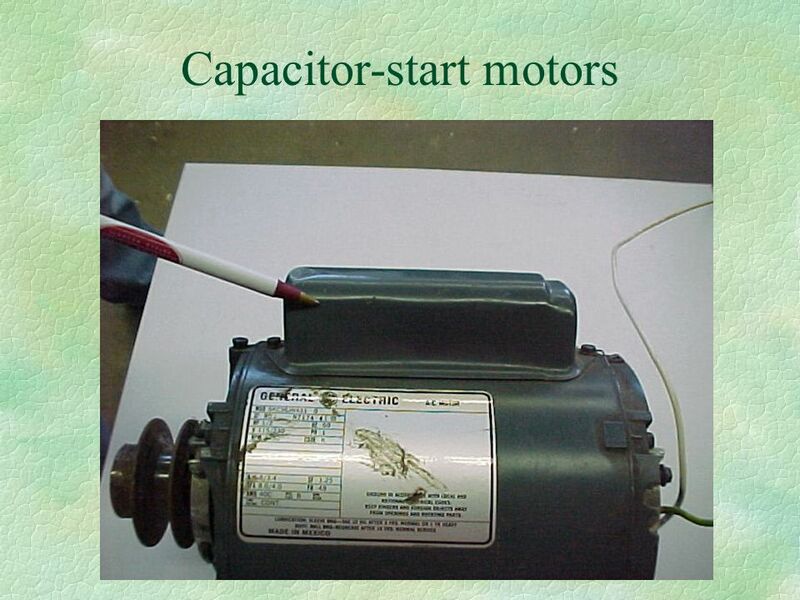 61 Capacitor motors Have starting and running windings in the stator and have squirrel-cage rotors. 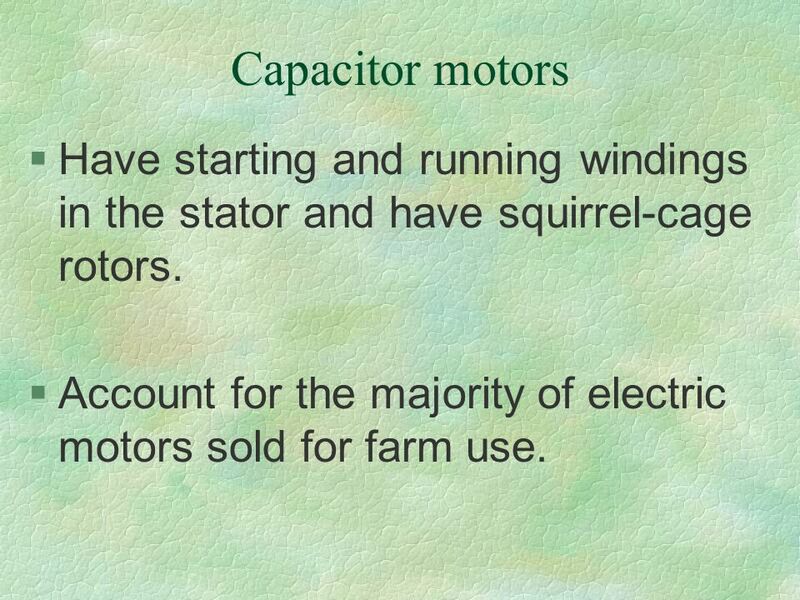 Account for the majority of electric motors sold for farm use. 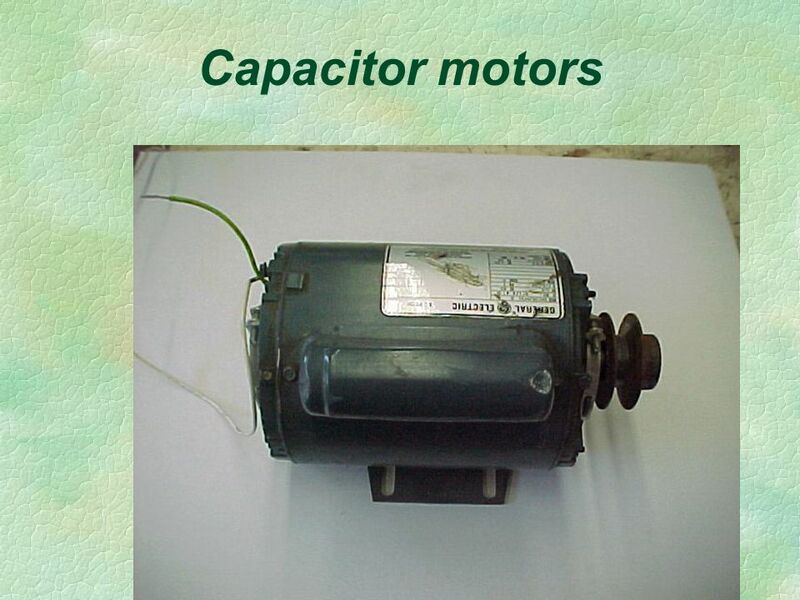 62 Capacitor motors Are a variety of types of capacitor motors. 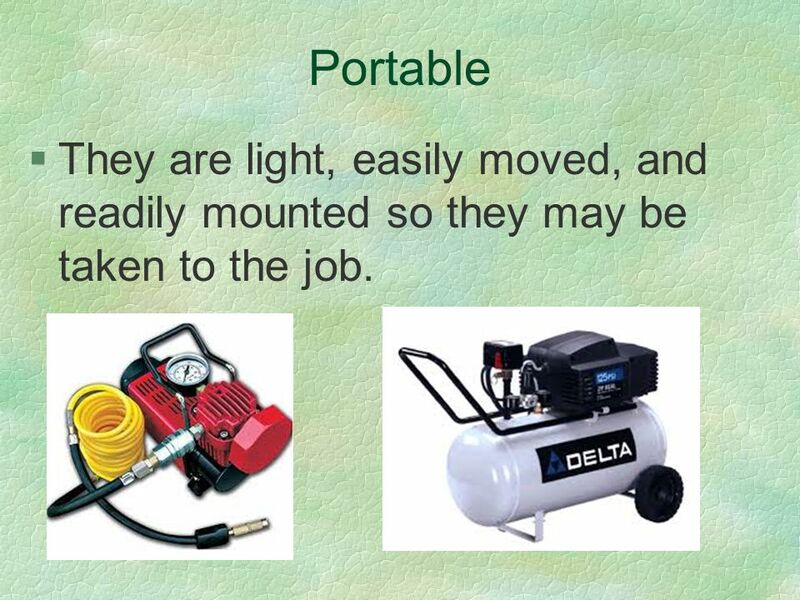 Are used for hard to start loads such as water pumps or air compressors. They have a capacitor placed in series with the starting winding. 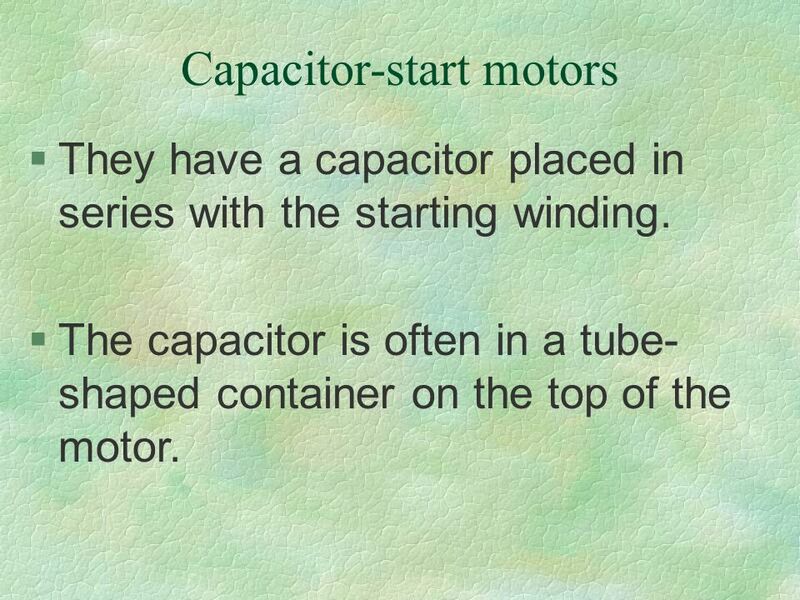 The capacitor is often in a tube-shaped container on the top of the motor. 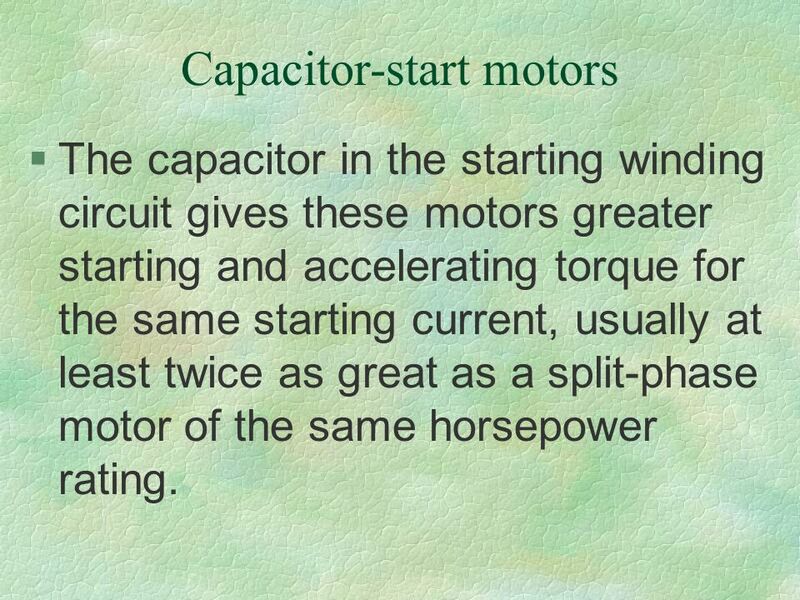 The capacitor in the starting winding circuit gives these motors greater starting and accelerating torque for the same starting current, usually at least twice as great as a split-phase motor of the same horsepower rating. These are used on hard-to-start loads. They range in size from 1 /8 hp to 10 hp and generally can be connected to either 120 or 240 volts. 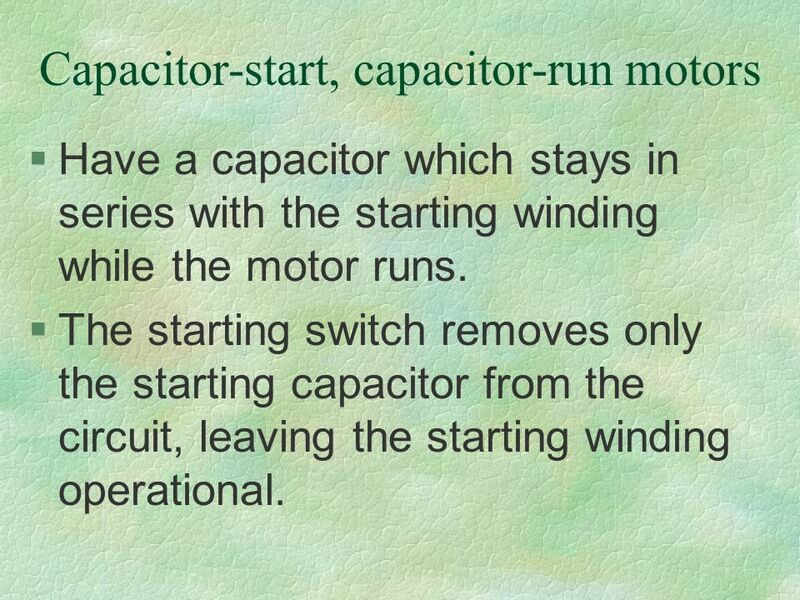 Have a capacitor which stays in series with the starting winding while the motor runs. The starting switch removes only the starting capacitor from the circuit, leaving the starting winding operational. These operate more efficiently because they require lower line current when running. 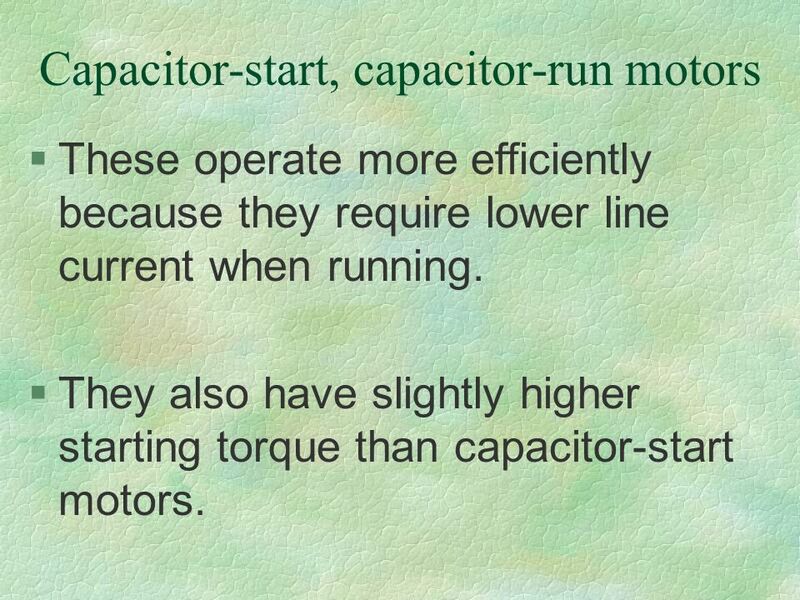 They also have slightly higher starting torque than capacitor-start motors. 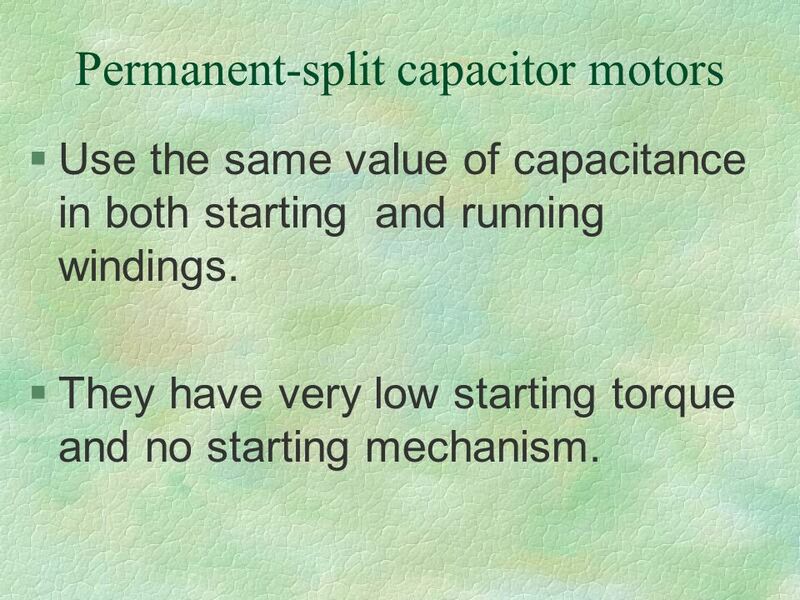 Use the same value of capacitance in both starting and running windings. 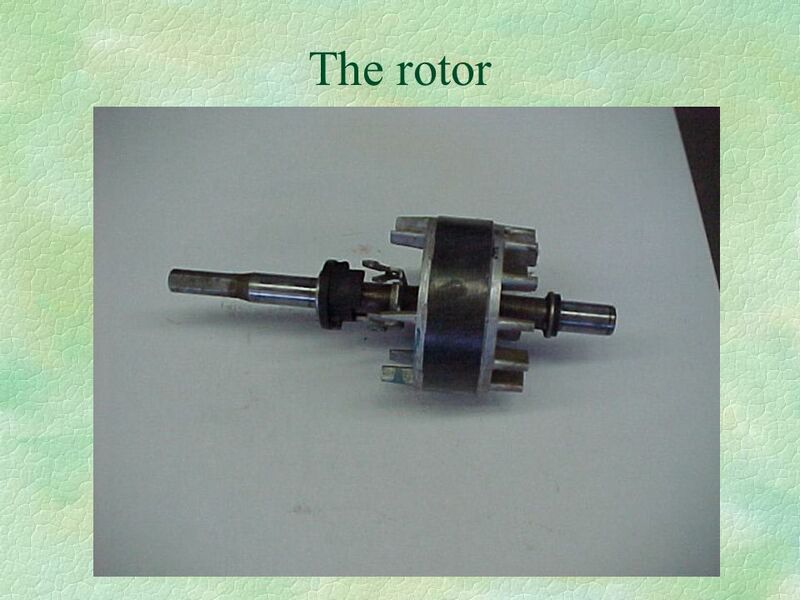 They have very low starting torque and no starting mechanism. 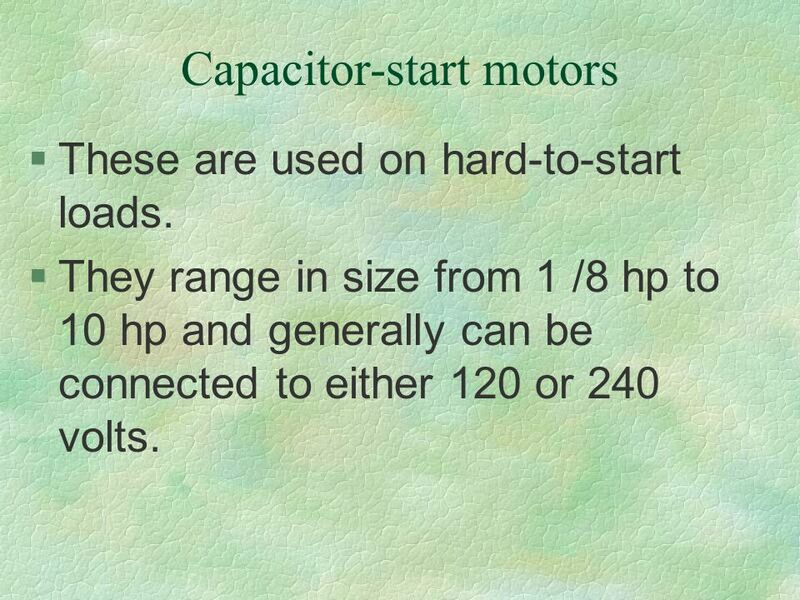 Have the same high starting torque as the capacitor start motors and can be used for the same type of loads. 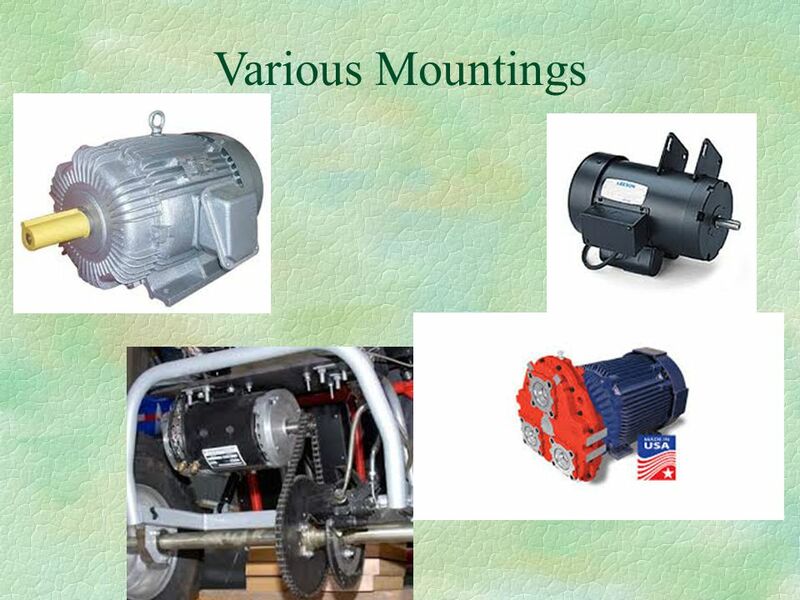 They are heavy-duty motors and can be operated on either 120 or 240 volts. They have more moving parts, have a higher first cost, and require more maintenance. They are available from 1 /6 hp to 10 hp. Reversing is accomplished by shifting the position of the brushes. 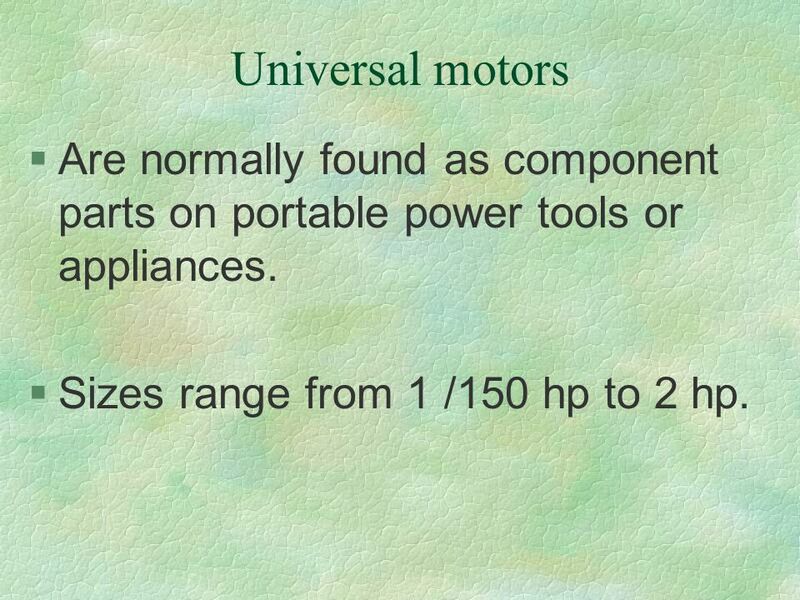 76 Universal motors Are normally found as component parts on portable power tools or appliances. Sizes range from 1 /150 hp to 2 hp. 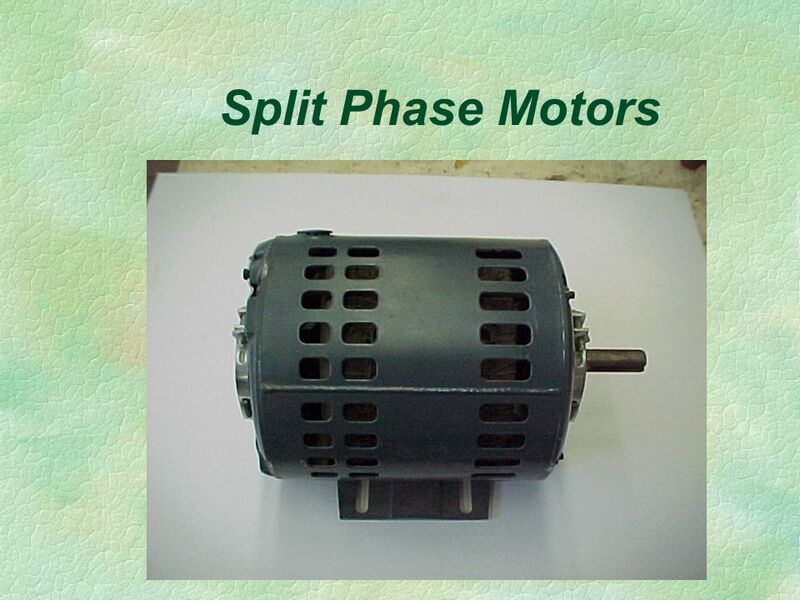 78 Three-phase motors Are very simple in construction, have few moving parts, and require a minimum of maintenance. They have high starting torque and are used for difficult to start loads. 79 Three-phase motors Their size ranges from ¼ hp to as high as 500 hp. 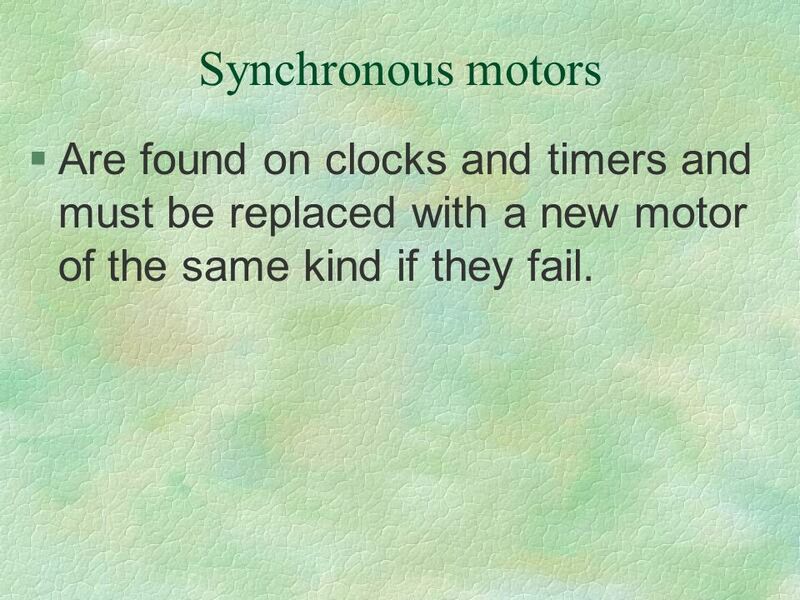 80 Synchronous motors Are found on clocks and timers and must be replaced with a new motor of the same kind if they fail. 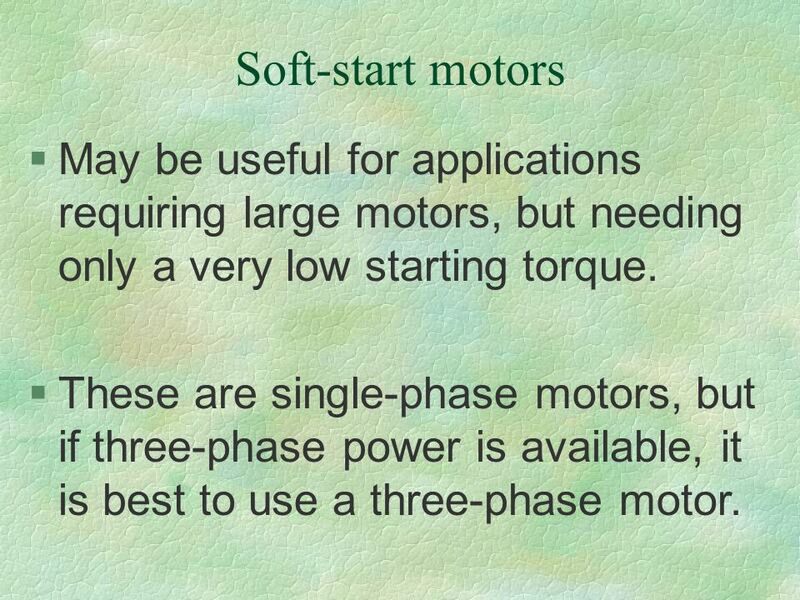 82 Soft-start motors May be useful for applications requiring large motors, but needing only a very low starting torque. 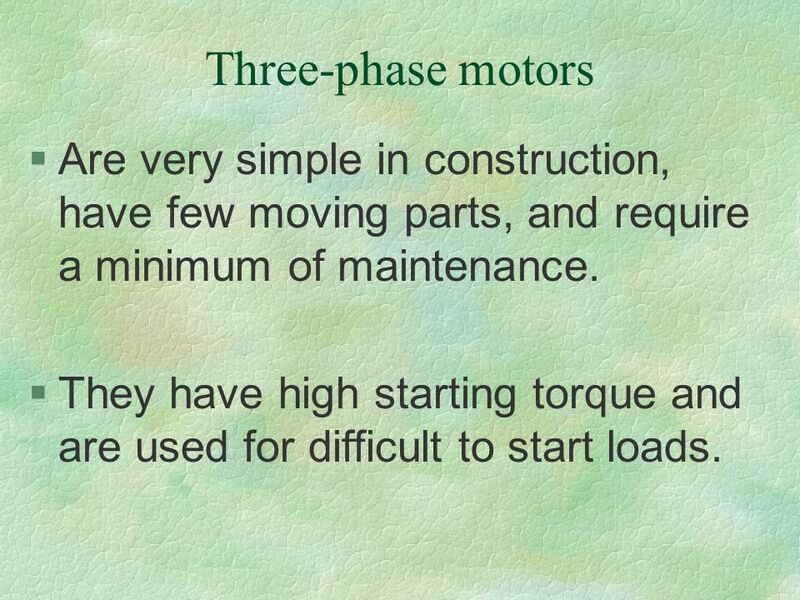 These are single-phase motors, but if three-phase power is available, it is best to use a three-phase motor. 84 What are the different types of motor enclosures and how are they different? 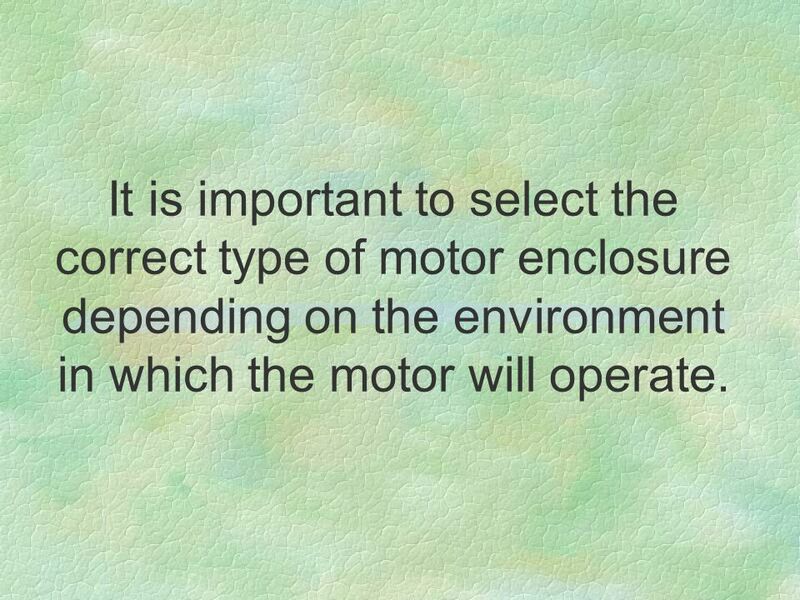 85 It is important to select the correct type of motor enclosure depending on the environment in which the motor will operate. 86 Open enclosures Are designed for use indoors where the motor will be kept dry and clean. 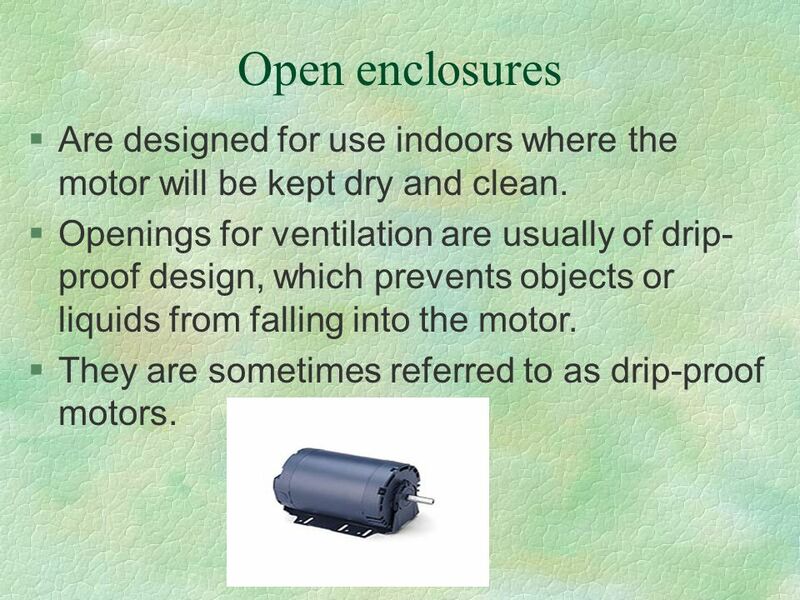 Openings for ventilation are usually of drip-proof design, which prevents objects or liquids from falling into the motor. 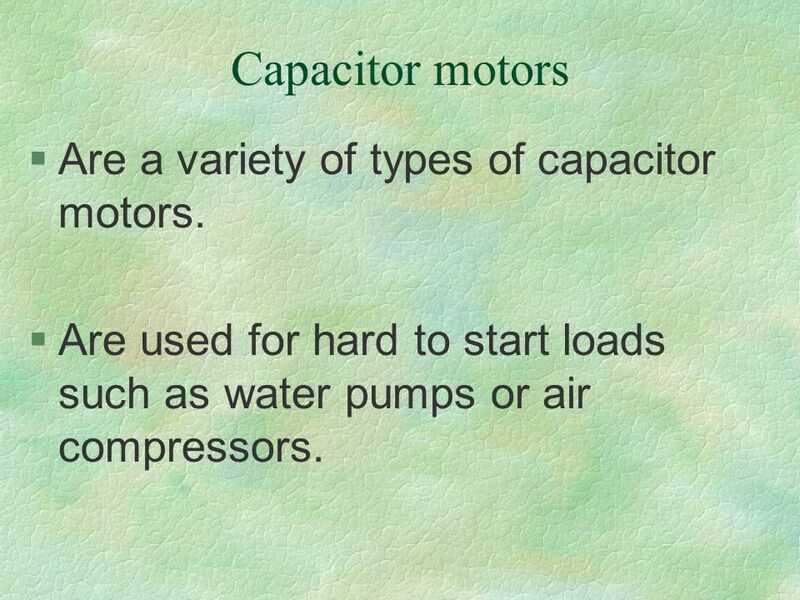 They are sometimes referred to as drip-proof motors. May be used indoors or outdoors in mild climates. 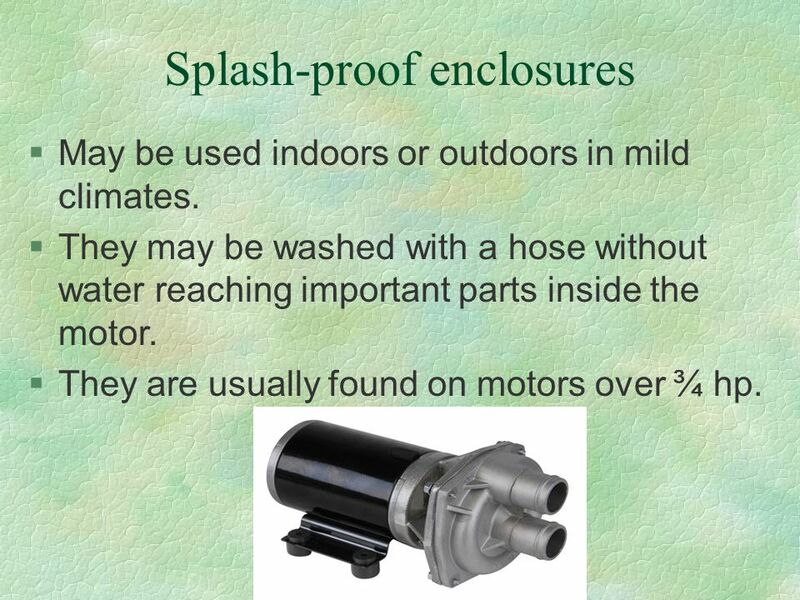 They may be washed with a hose without water reaching important parts inside the motor. 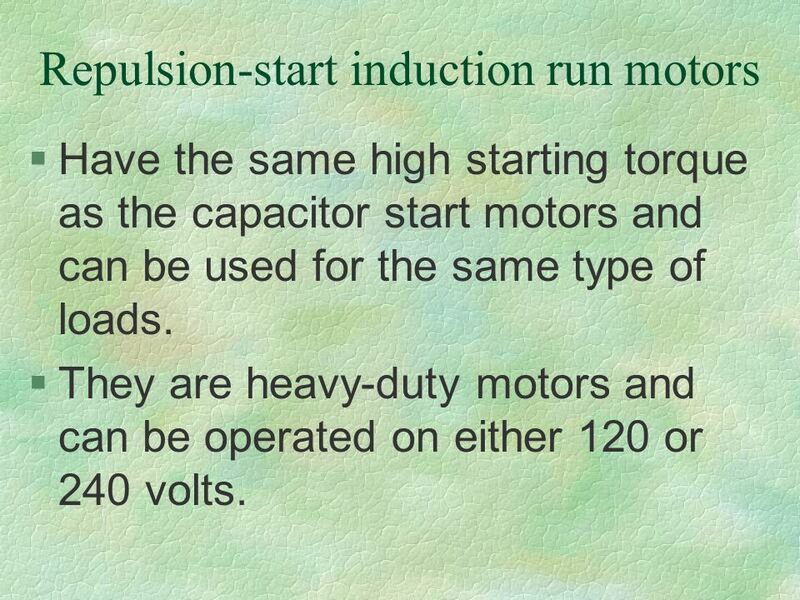 They are usually found on motors over ¾ hp. Are recommended for extremely dirty conditions. 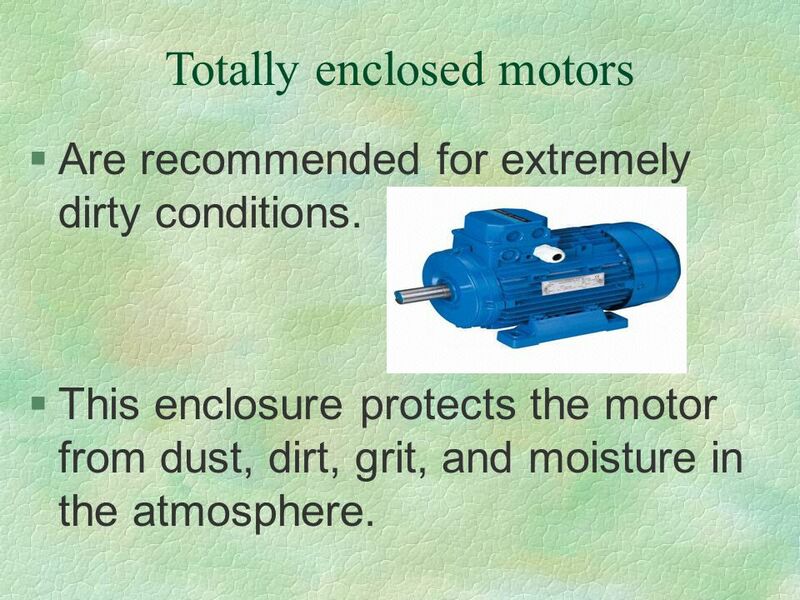 This enclosure protects the motor from dust, dirt, grit, and moisture in the atmosphere. Are manufactured in two totally enclosed types of enclosures. One will withstand an explosion of gas or vapor inside it without igniting the gas or vapor surrounding it. 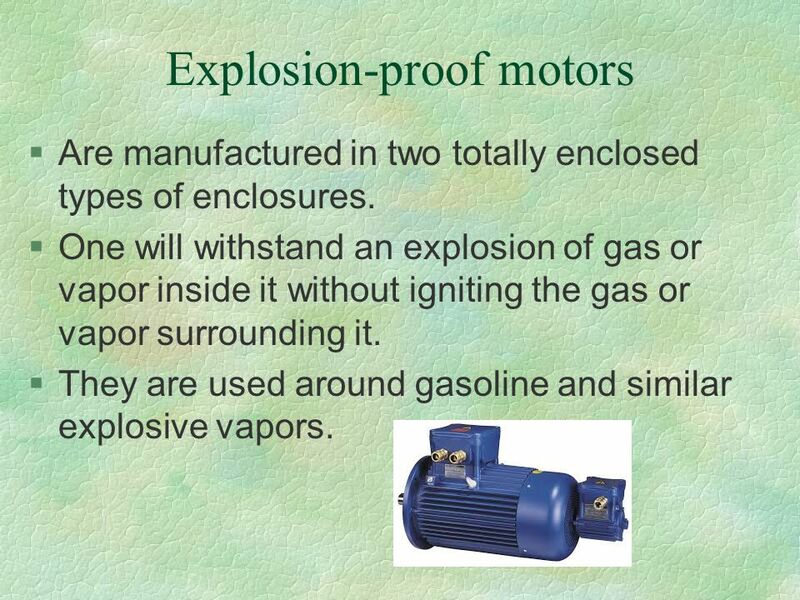 They are used around gasoline and similar explosive vapors. 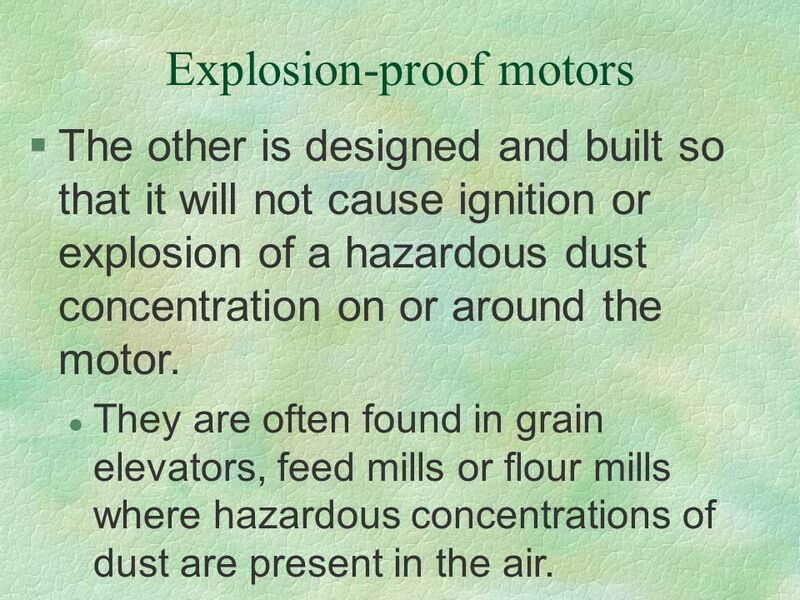 The other is designed and built so that it will not cause ignition or explosion of a hazardous dust concentration on or around the motor. They are often found in grain elevators, feed mills or flour mills where hazardous concentrations of dust are present in the air. 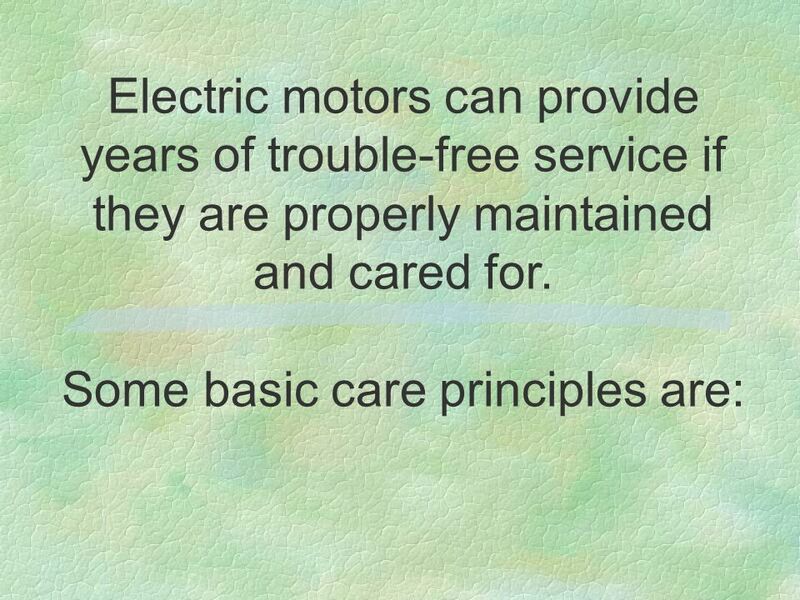 91 What are proper maintenance and care principles for electric motors? 93 Cleaning Should take place at least once a year and more often if used in extreme conditions. Always clean the outside before disassembling the motor. 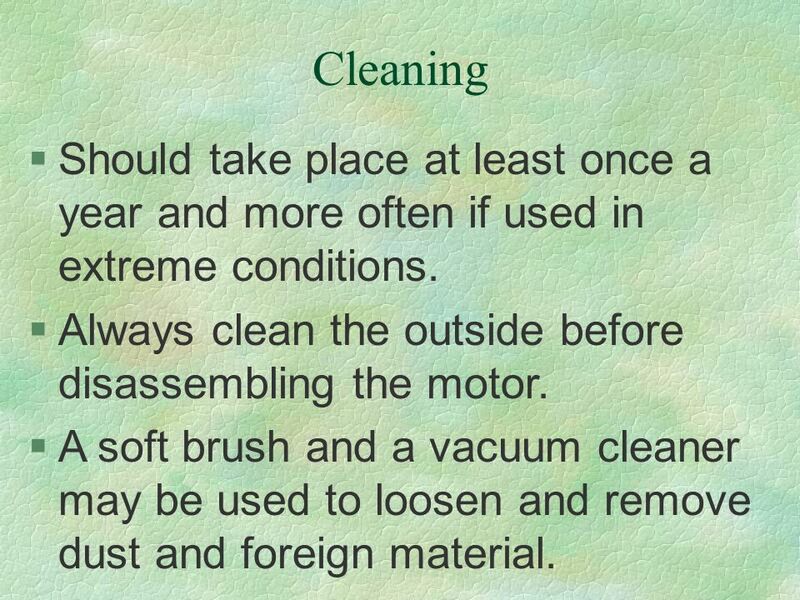 A soft brush and a vacuum cleaner may be used to loosen and remove dust and foreign material. 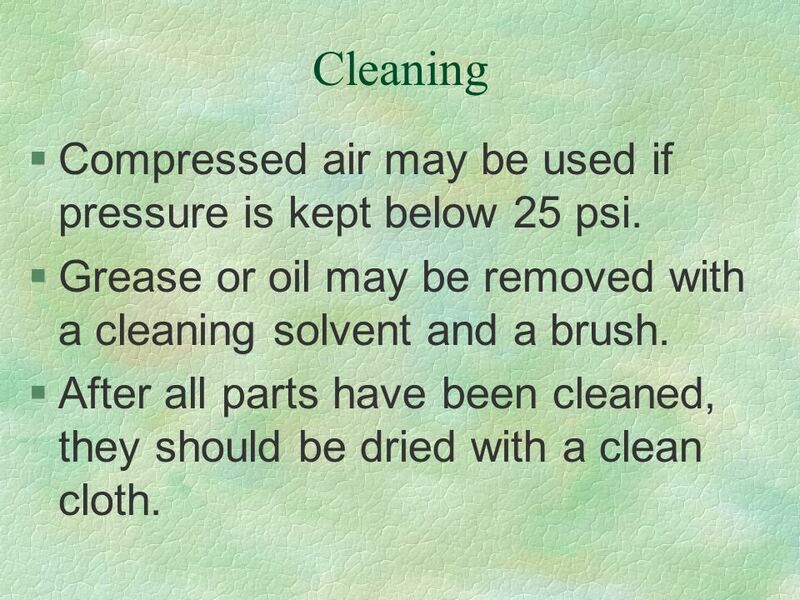 94 Cleaning Compressed air may be used if pressure is kept below 25 psi. Grease or oil may be removed with a cleaning solvent and a brush. After all parts have been cleaned, they should be dried with a clean cloth. 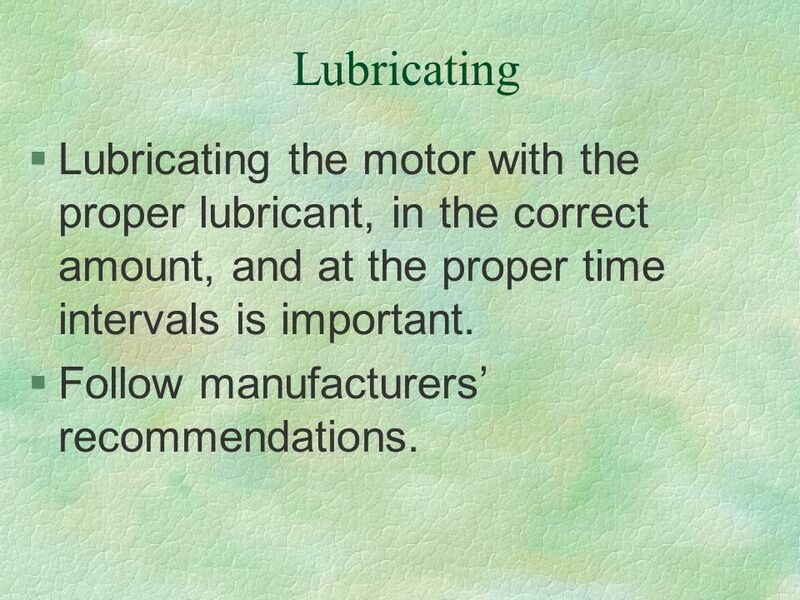 95 Lubricating Lubricating the motor with the proper lubricant, in the correct amount, and at the proper time intervals is important. Follow manufacturers’ recommendations. 96 Storage Storage is also important. 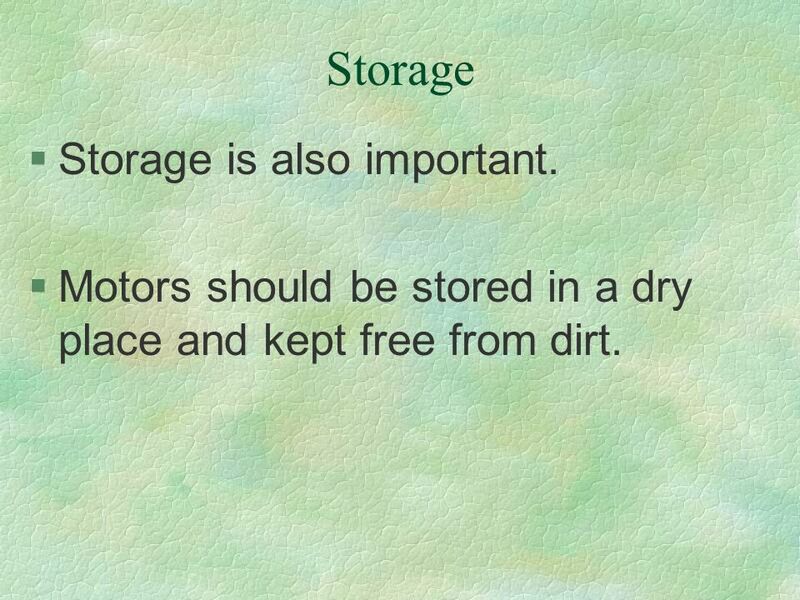 Motors should be stored in a dry place and kept free from dirt. 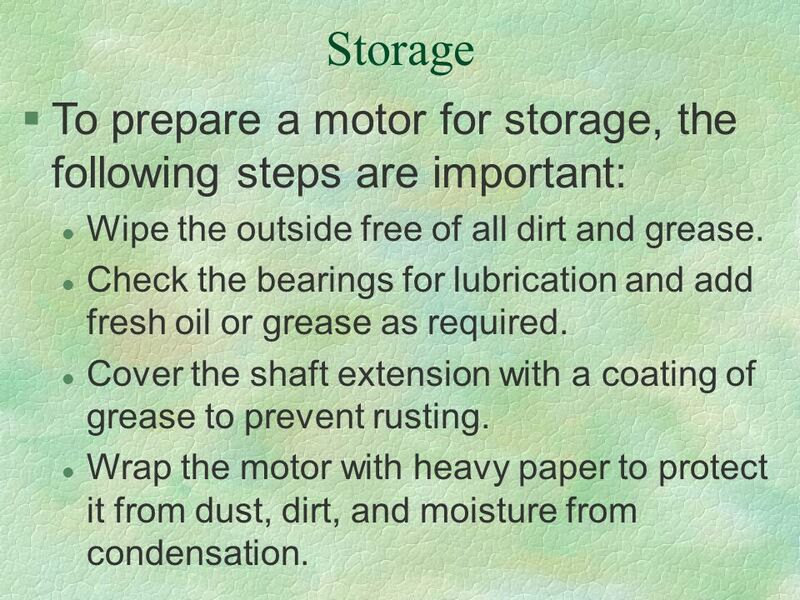 97 Storage To prepare a motor for storage, the following steps are important: Wipe the outside free of all dirt and grease. Check the bearings for lubrication and add fresh oil or grease as required. Cover the shaft extension with a coating of grease to prevent rusting. Wrap the motor with heavy paper to protect it from dust, dirt, and moisture from condensation. 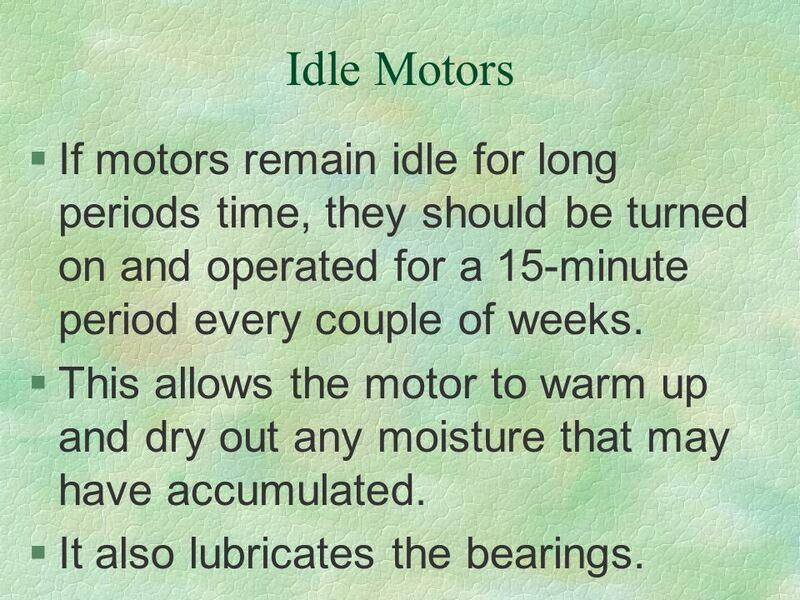 98 Idle Motors If motors remain idle for long periods time, they should be turned on and operated for a 15-minute period every couple of weeks. This allows the motor to warm up and dry out any moisture that may have accumulated. It also lubricates the bearings. 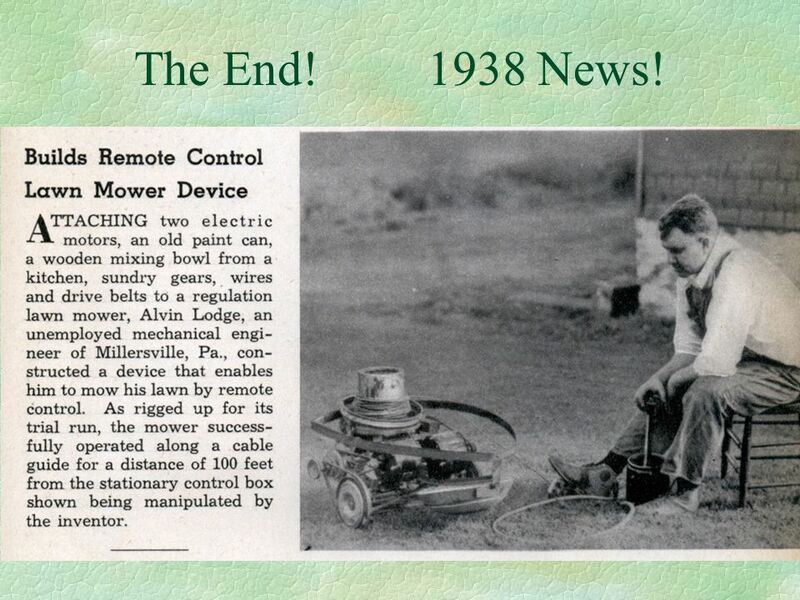 99 Why are electrical controls important in agriculture? 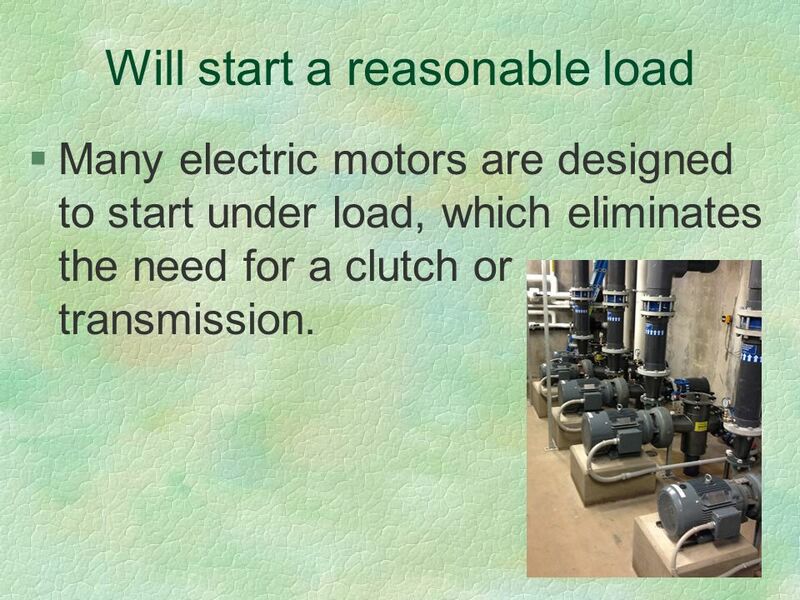 Electric motors must be controlled in a way that their power is used when and where it is needed. They must be used in the most efficient and economical way possible. 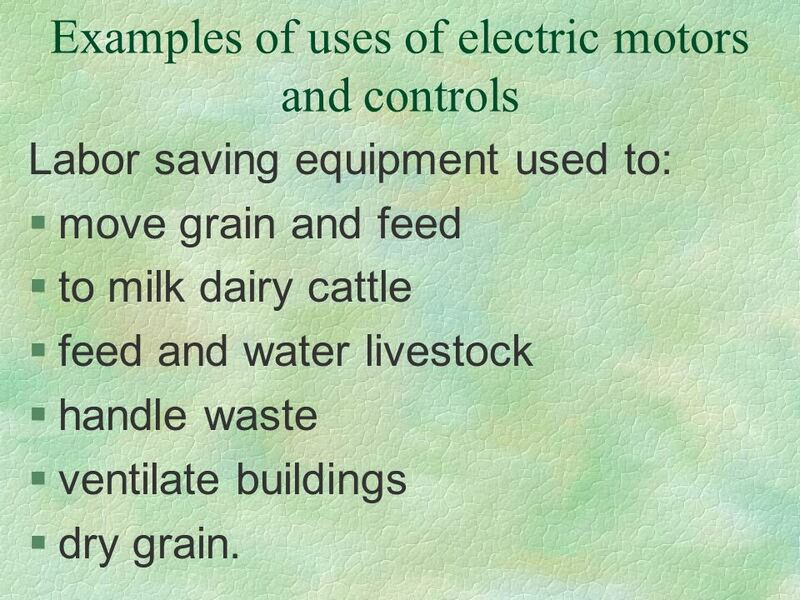 100 Why are electrical controls important in agriculture? 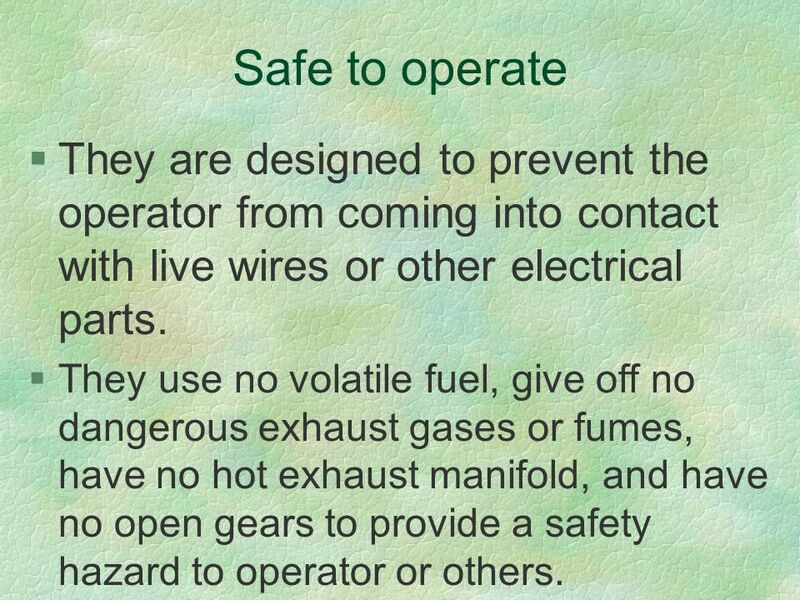 The system must provide safety for the operator, the motor, and the equipment being operated. The primary purpose of electrical controls and motors is to save labor through automation. Labor saving equipment used to: move grain and feed to milk dairy cattle feed and water livestock handle waste ventilate buildings dry grain. 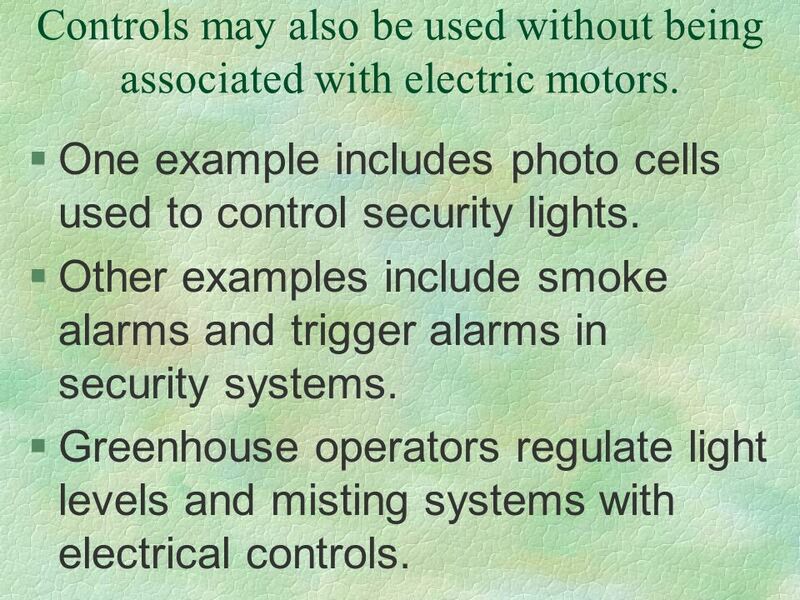 102 Controls may also be used without being associated with electric motors. One example includes photo cells used to control security lights. Other examples include smoke alarms and trigger alarms in security systems. Greenhouse operators regulate light levels and misting systems with electrical controls. 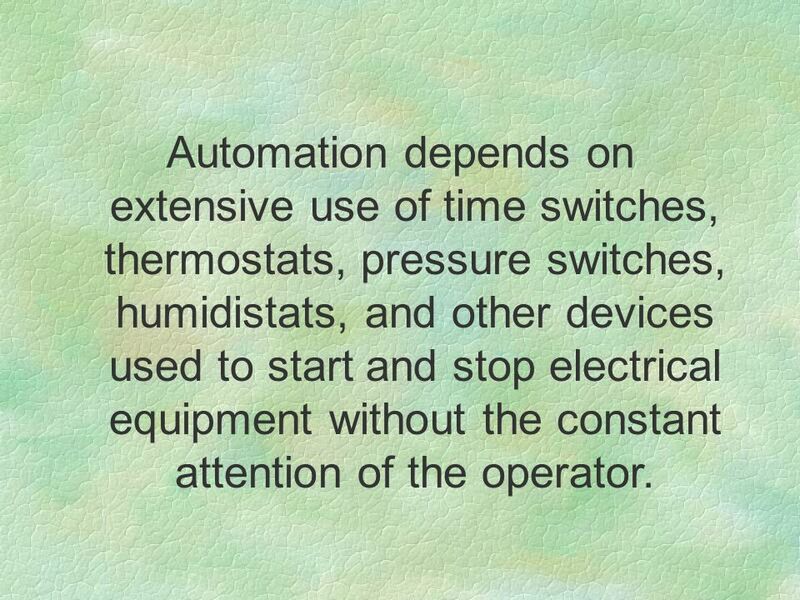 103 Automation depends on extensive use of time switches, thermostats, pressure switches, humidistats, and other devices used to start and stop electrical equipment without the constant attention of the operator. 105 Basic Maintenance Cleaning the controls so heat does not build up and moisture does not accumulate. 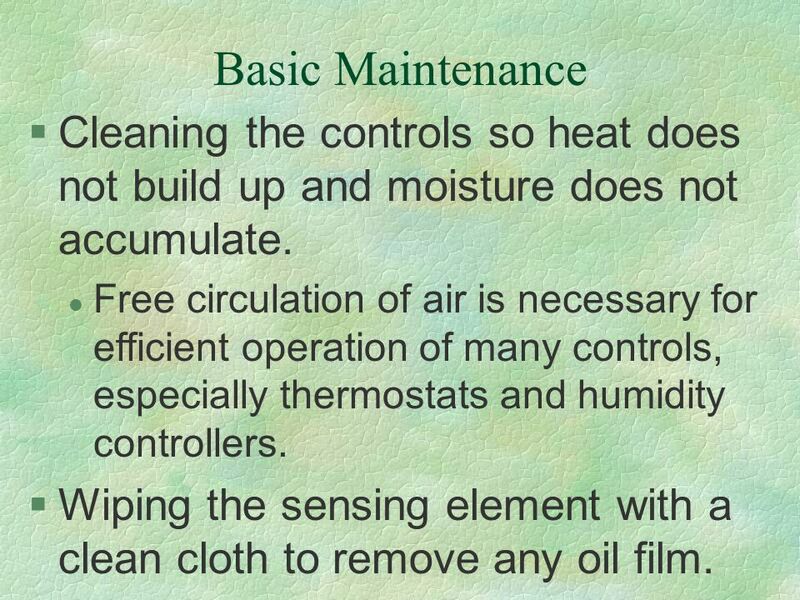 Free circulation of air is necessary for efficient operation of many controls, especially thermostats and humidity controllers. Wiping the sensing element with a clean cloth to remove any oil film. 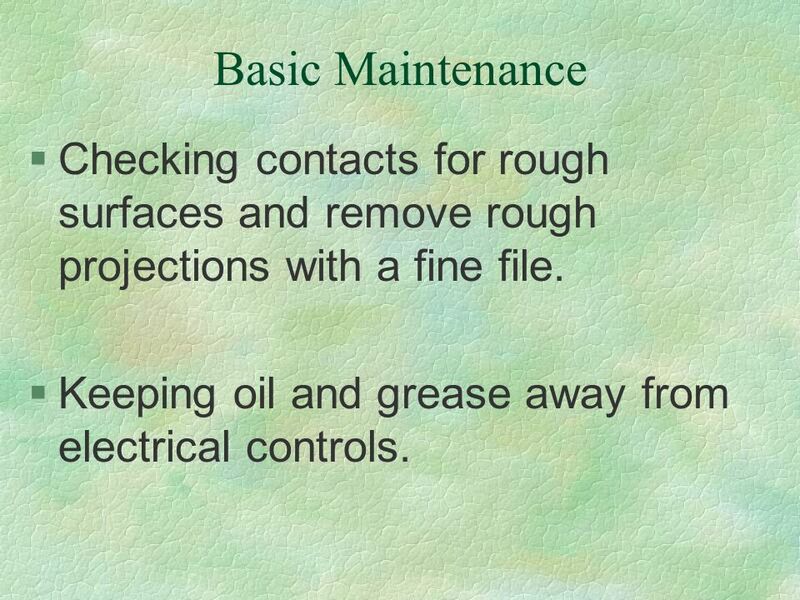 106 Basic Maintenance Checking contacts for rough surfaces and remove rough projections with a fine file. Keeping oil and grease away from electrical controls. 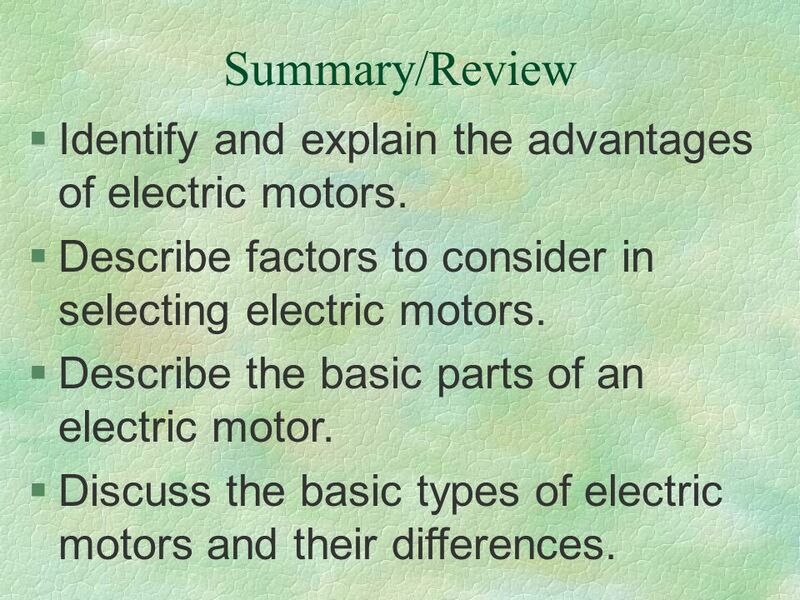 107 Summary/Review Identify and explain the advantages of electric motors. 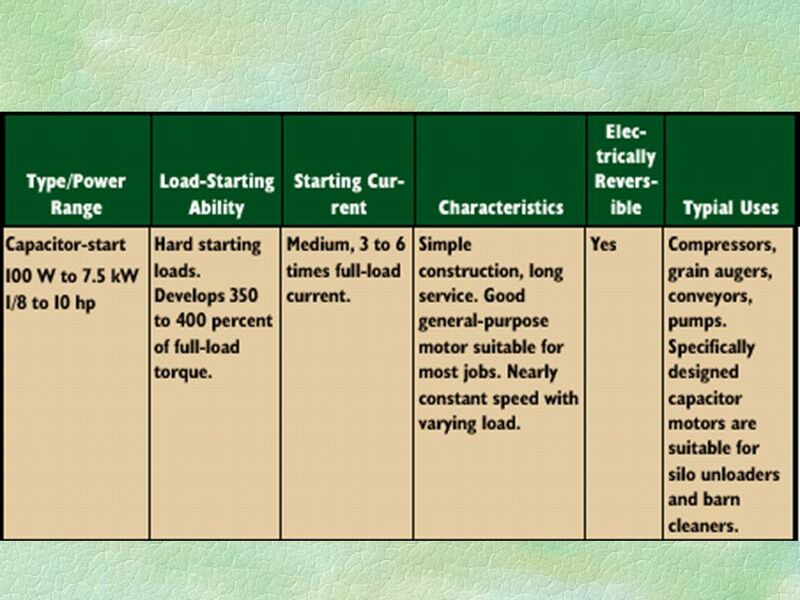 Describe factors to consider in selecting electric motors. 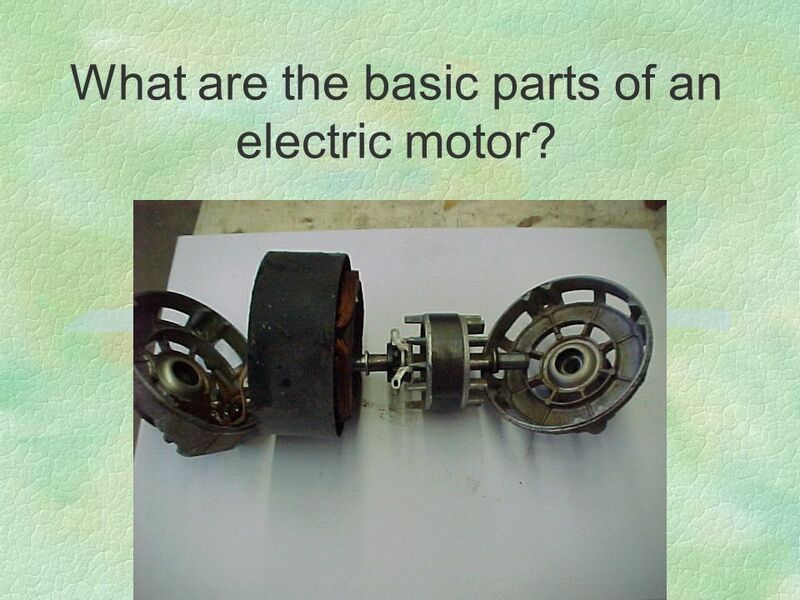 Describe the basic parts of an electric motor. 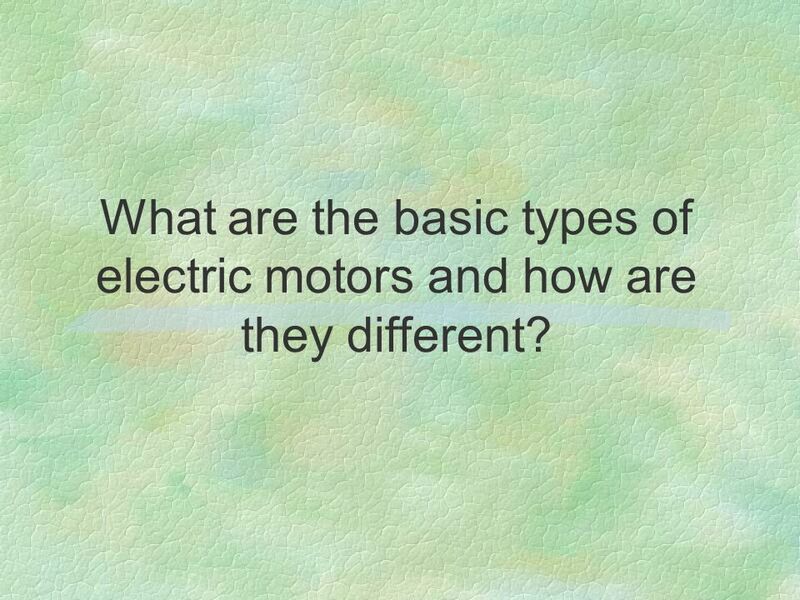 Discuss the basic types of electric motors and their differences. 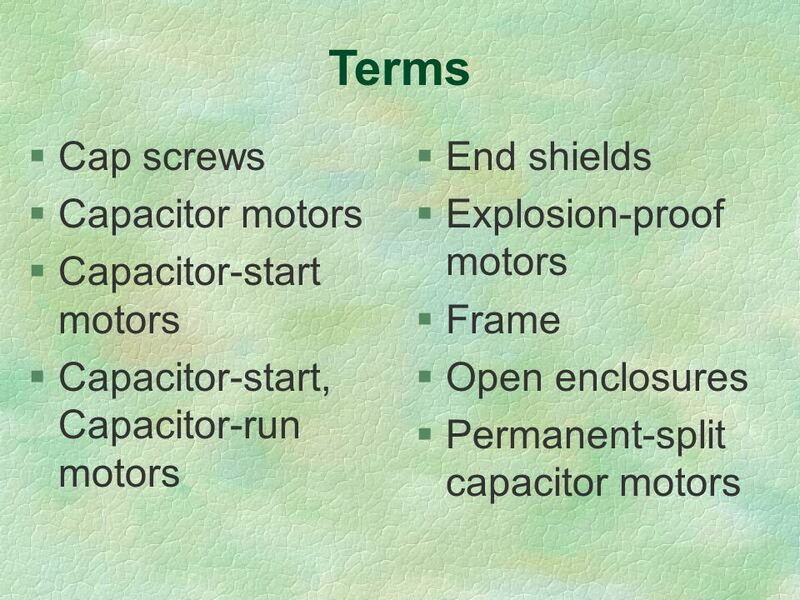 108 Summary/Review Identify and describe the different types of motor enclosures. 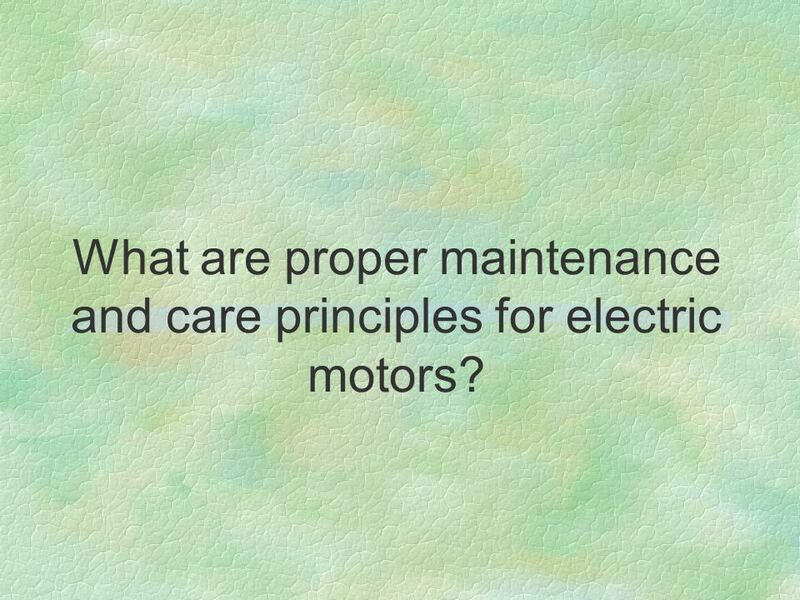 Describe the proper maintenance and care principles for electric motors. 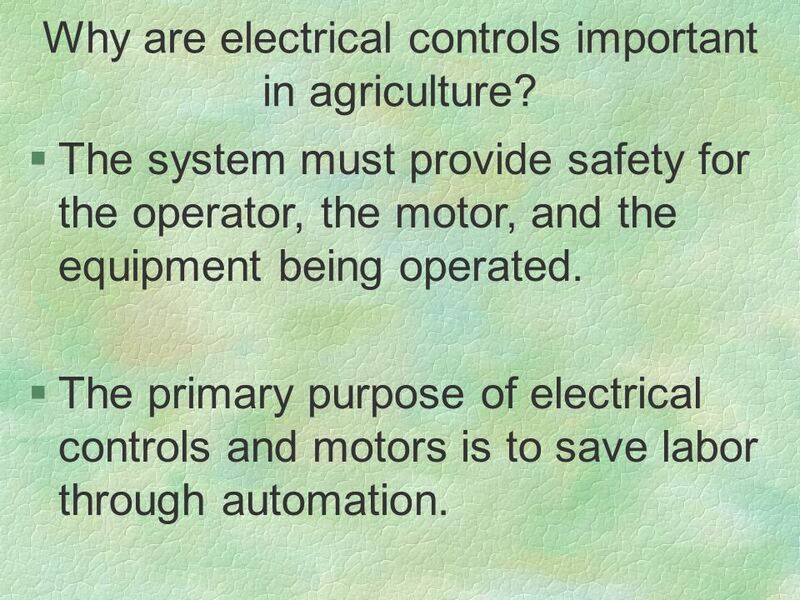 Describe the importance of electrical controls in agriculture. 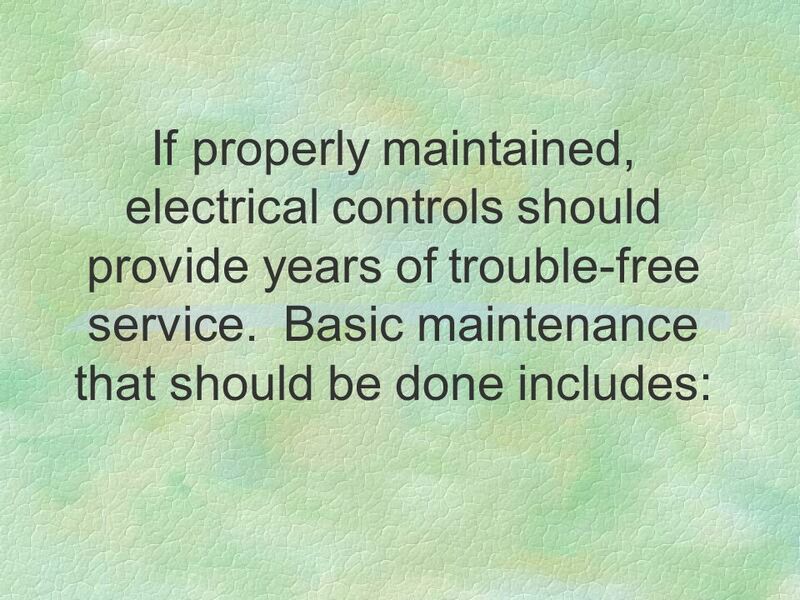 Describe the proper maintenance principles for electrical controls. 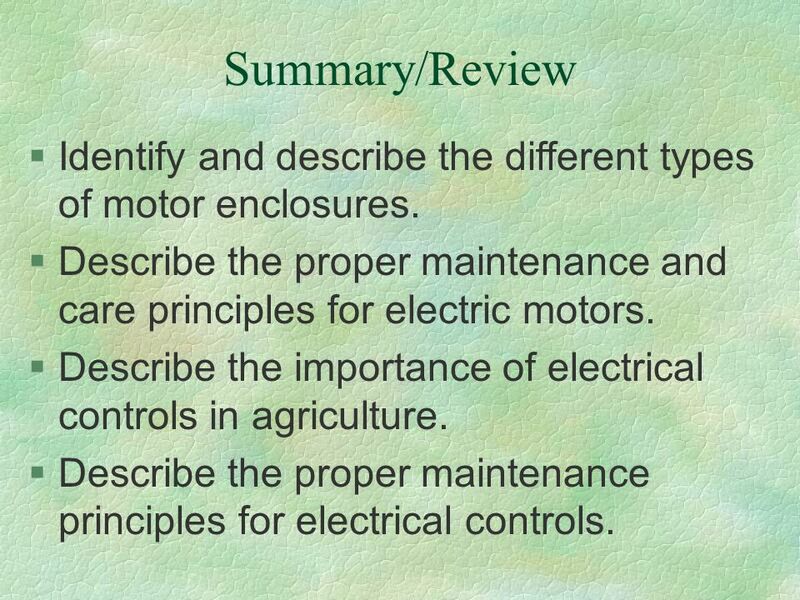 Download ppt "Agricultural Mechanics CD Selecting and Maintaining Electric Motors and Controls Lesson A4-8." Using Large Landscape Maintenance Equipment. Next Generation Science/Common Core Standards Addressed! CCSS.ELA Literacy.RST.9‐10.1 Cite specific textual. 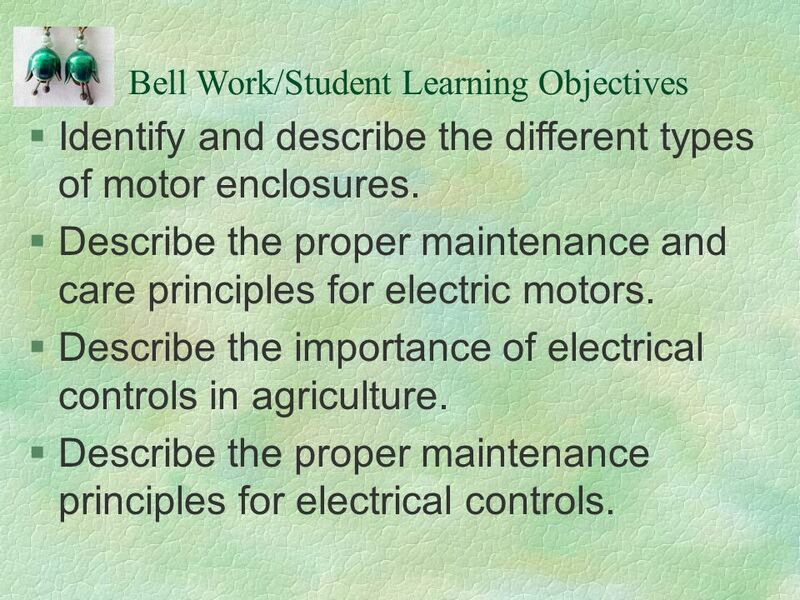 Lesson A1-2 Identifying Hazards in Agricultural Mechanics. Lesson 17 Working with Copper Tubing. Next Generation Science/Common Core Standards Addressed! n CCSS.ELA Literacy.RST.9 ‐ 10.3 Follow precisely a complex. Lesson 6 Using Multiple Cylinder Engines. Next Generation Science/Common Core Standards Addressed! CCSS.ELA Literacy.RST.9 ‐ 10.1 Cite specific textual. Interest Approach Identify the major systems of an engine. Section 2 Safety, Tools and Equipment, Shop Practices Unit 4 General Safety Practices. Operating, Calibrating, and Maintaining Feed Handling Systems Lesson 8. 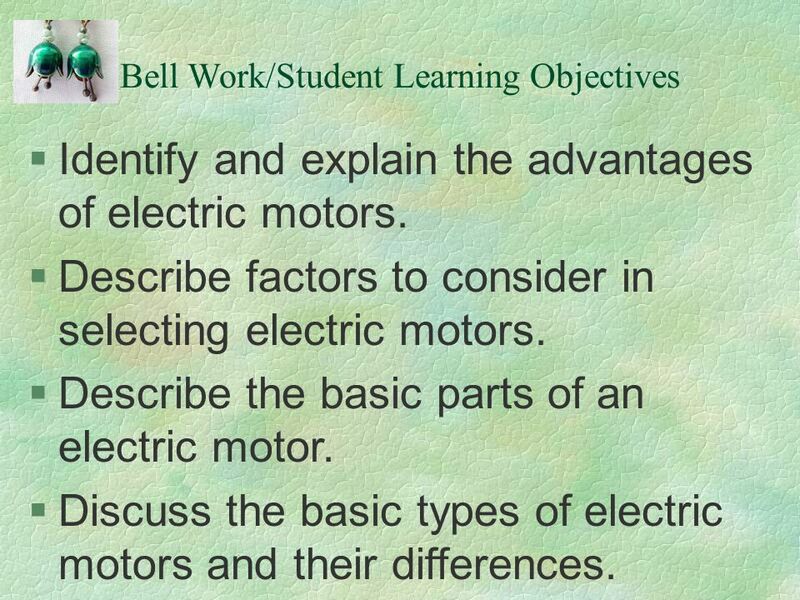 Chapter 9 Basic Electric Motors. 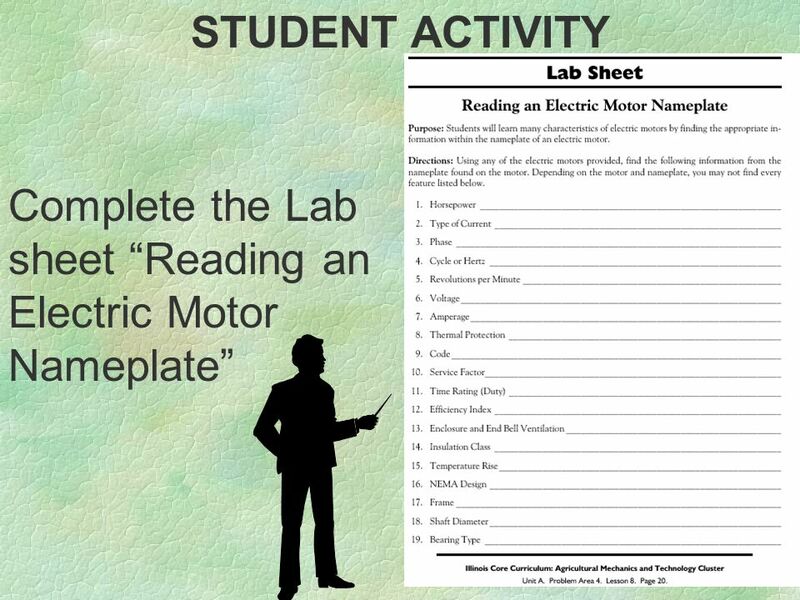 Problem Area 7 Identifying Basic Principles of Electricity.